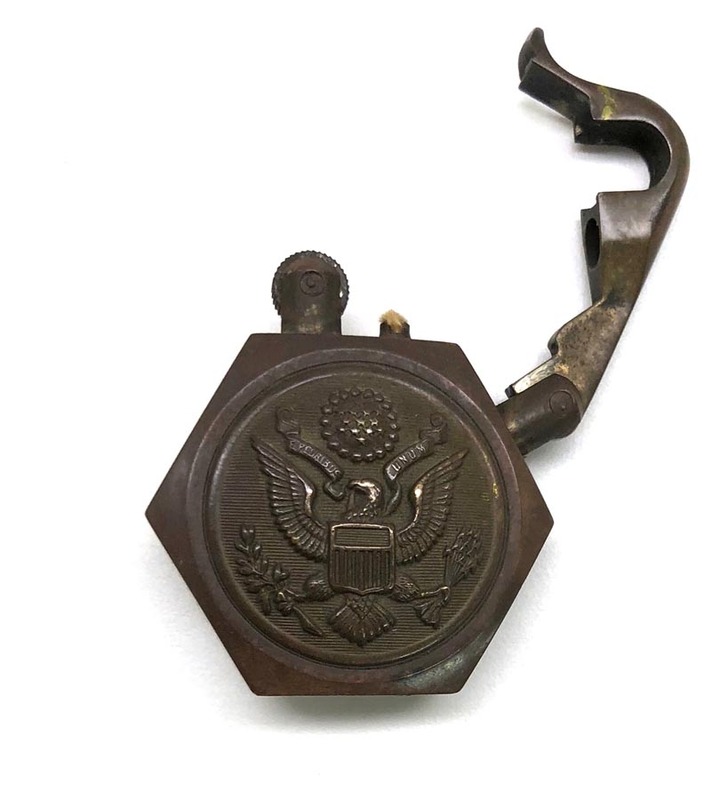 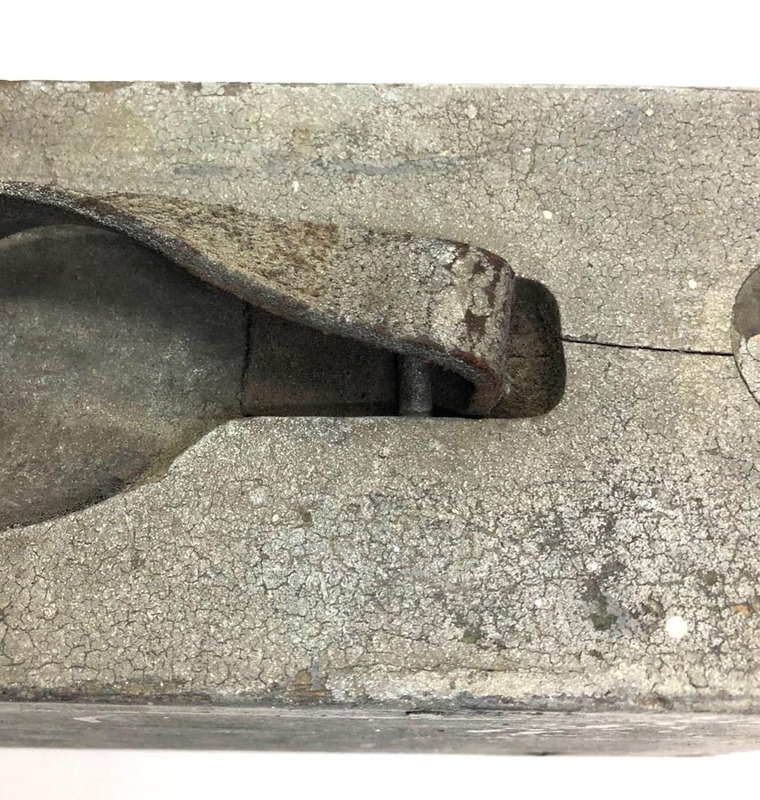 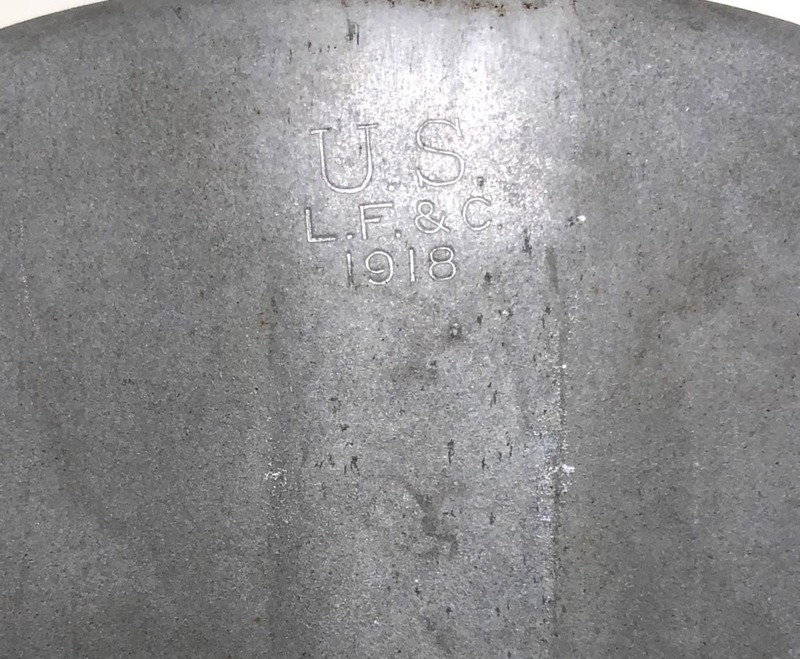 PHYSICAL DESCRIPTION: This WW1 US Hatchet Cover is in nice condition showing some wear. 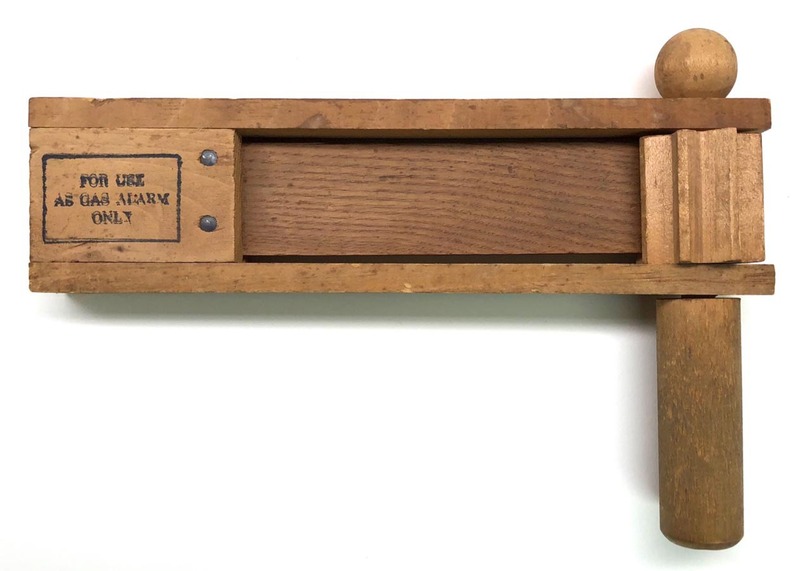 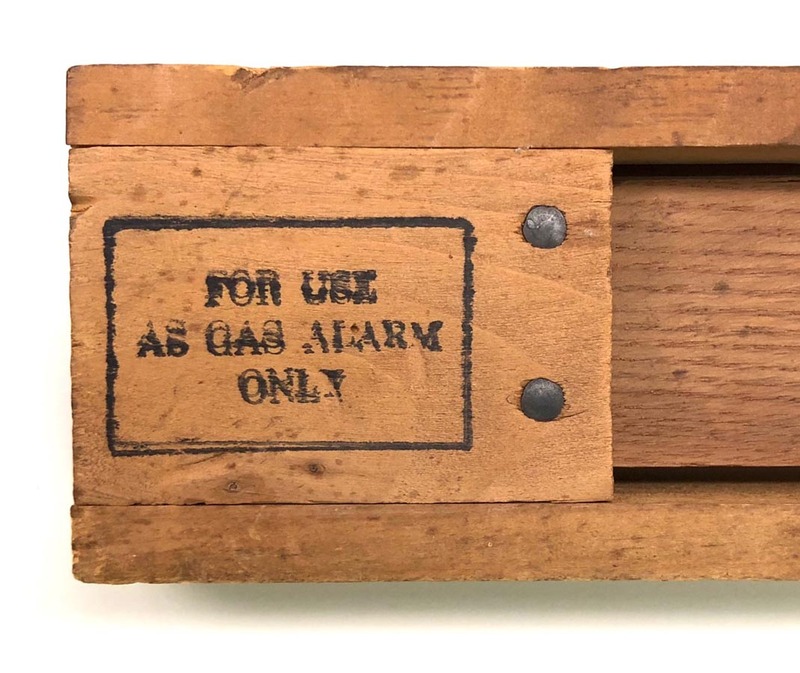 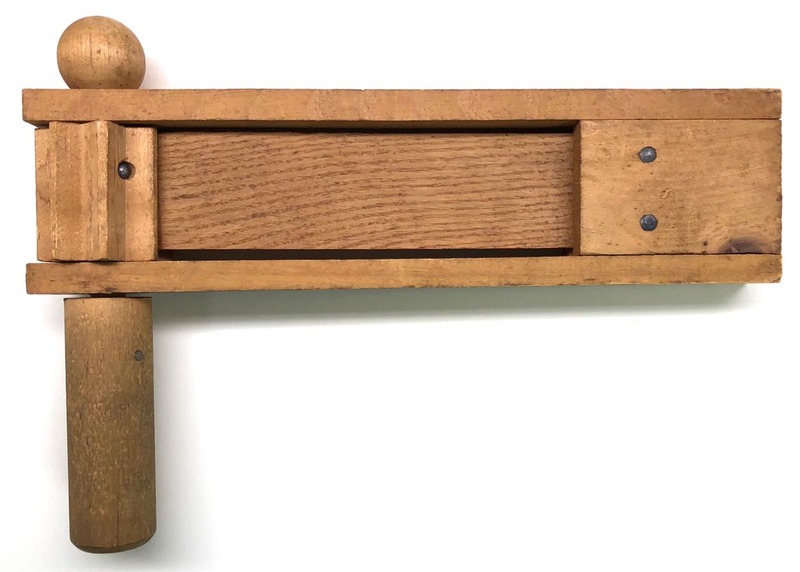 PHYSICAL DESCRIPTION: This WW1 US Gas Alarm Rattle is in real nice condition and functions great. 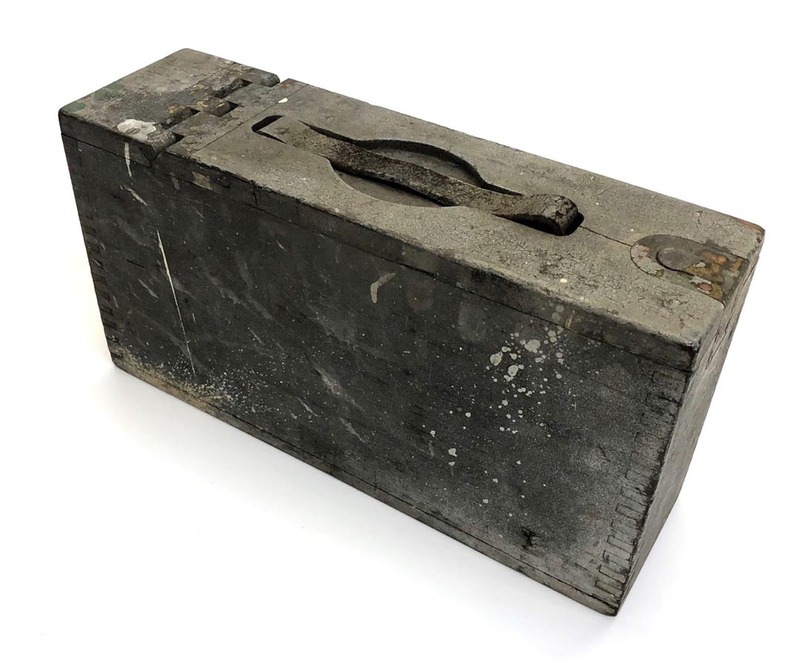 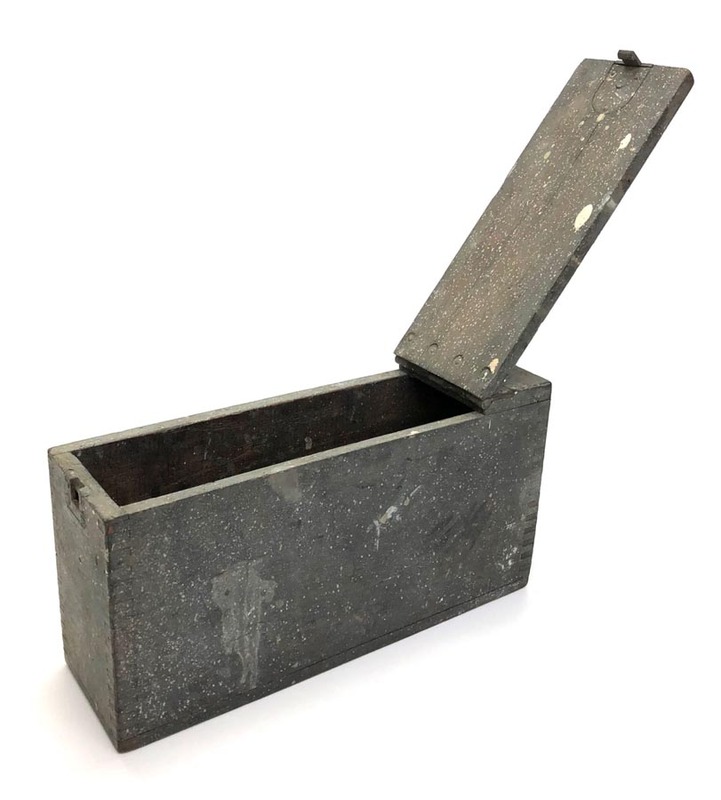 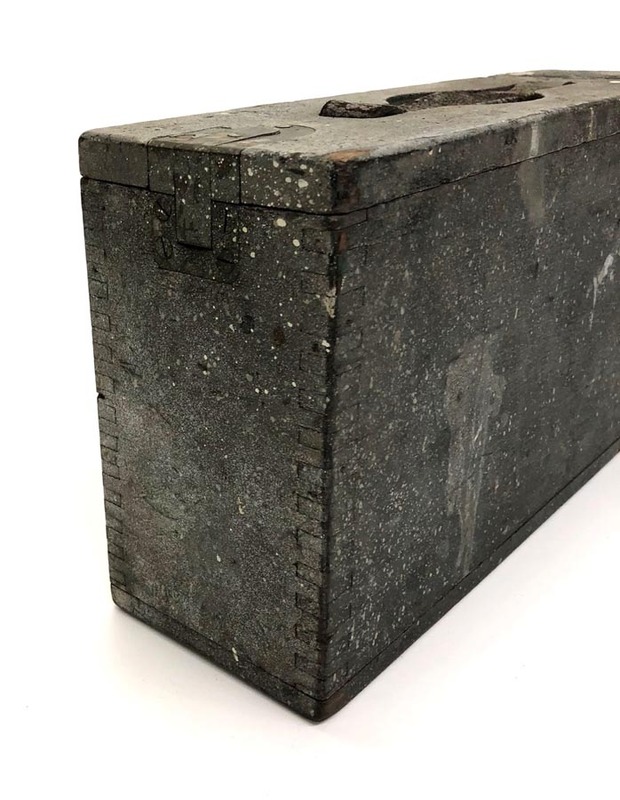 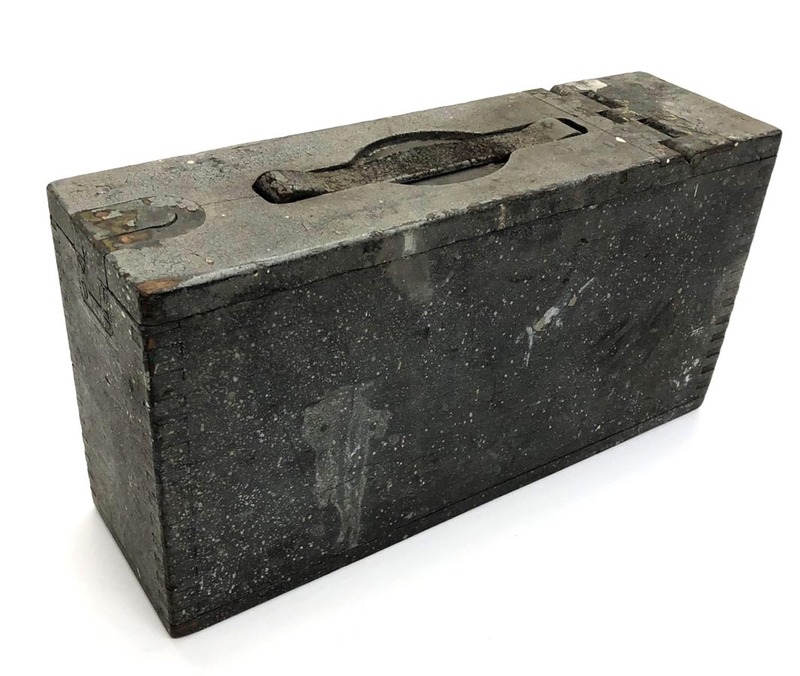 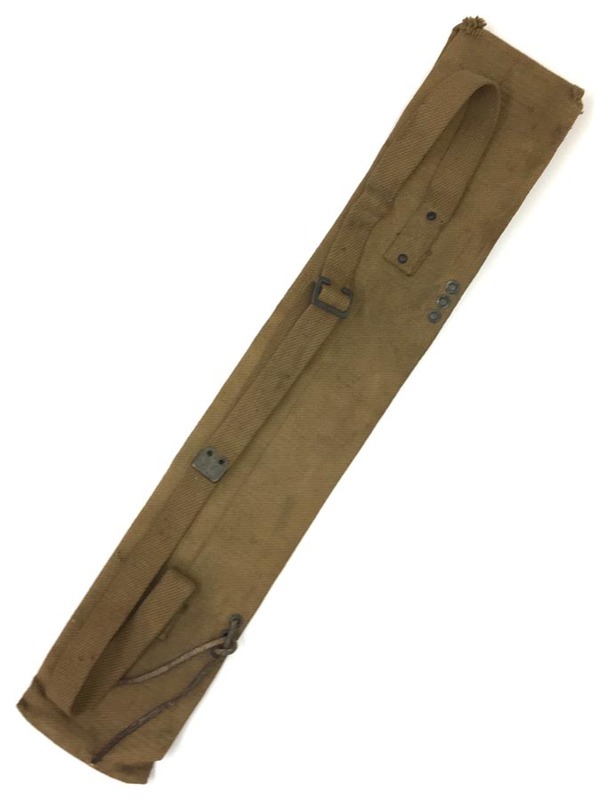 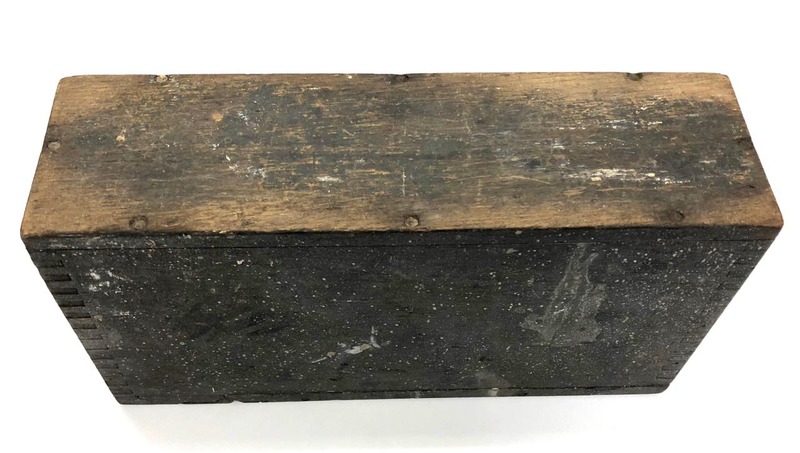 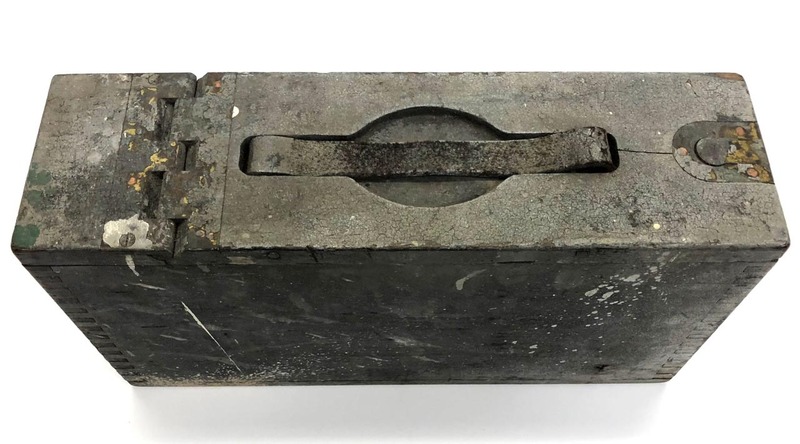 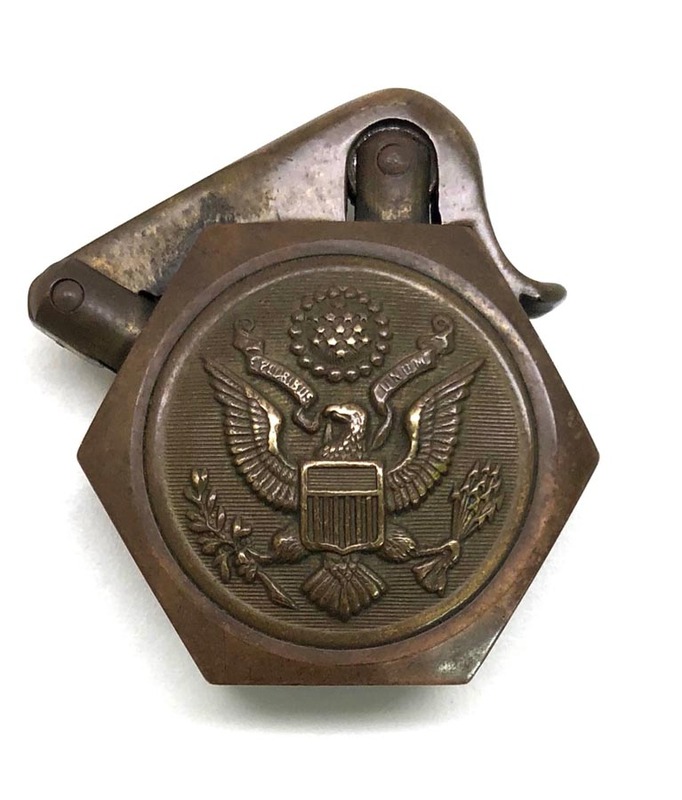 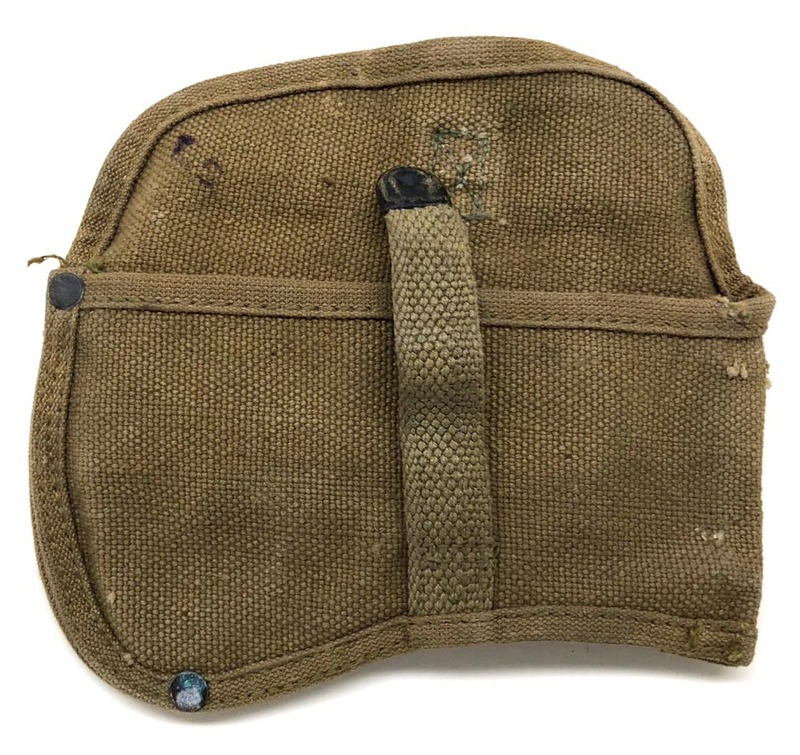 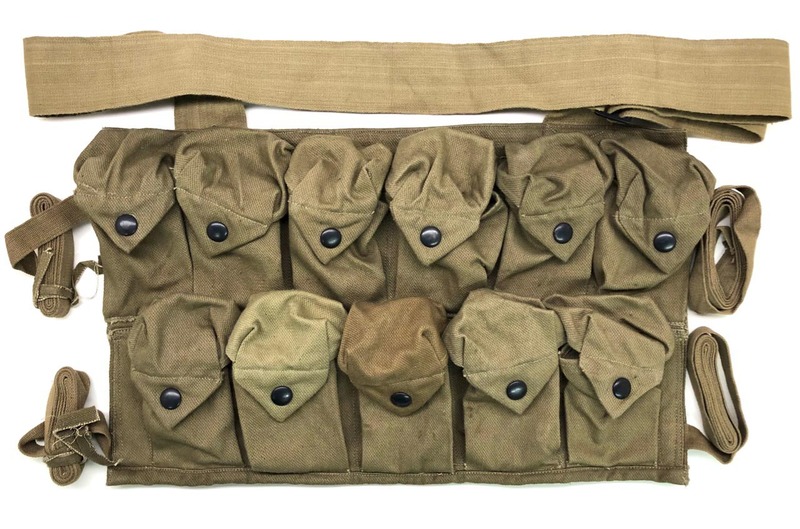 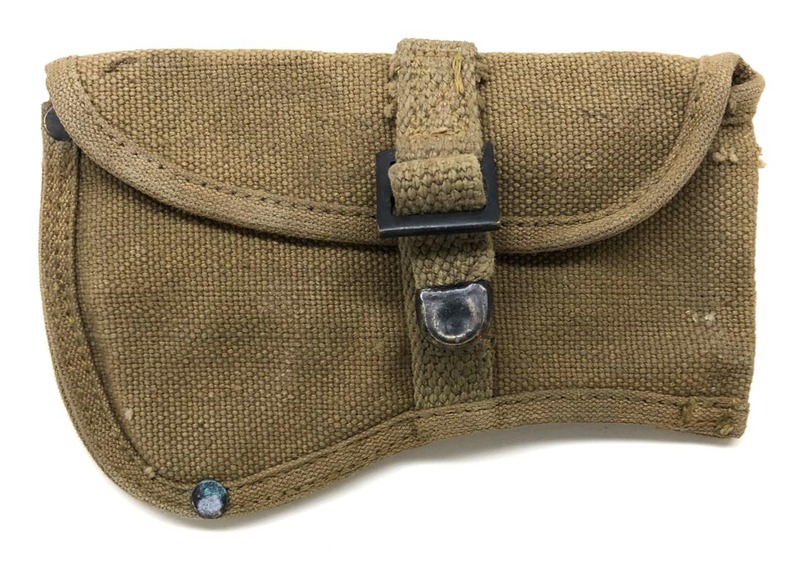 PHYSICAL DESCRIPTION: This WW1 US 1911 Magazine Ammo Pouch is in excellent unused condition. 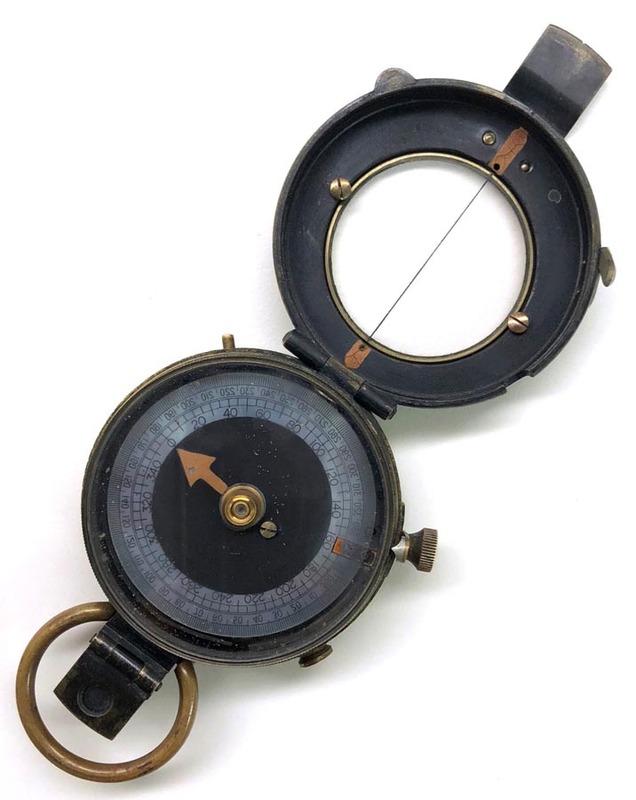 Both snaps function great. 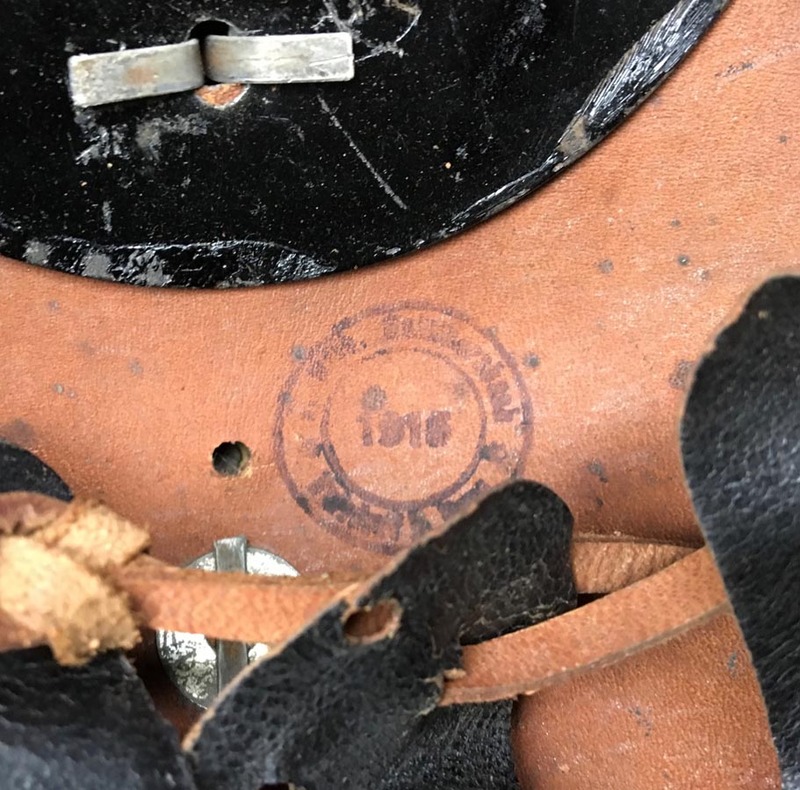 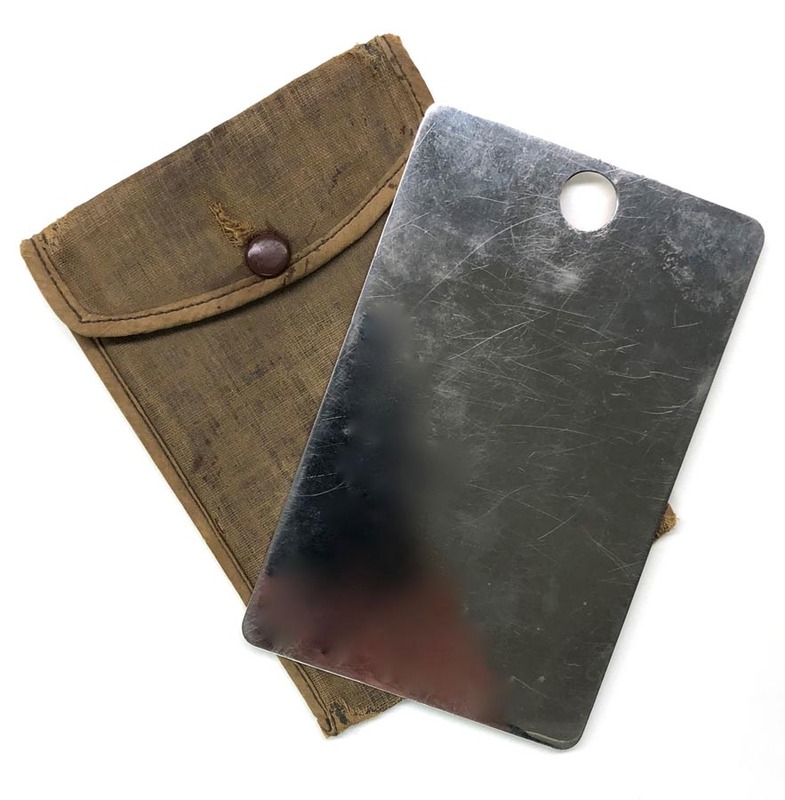 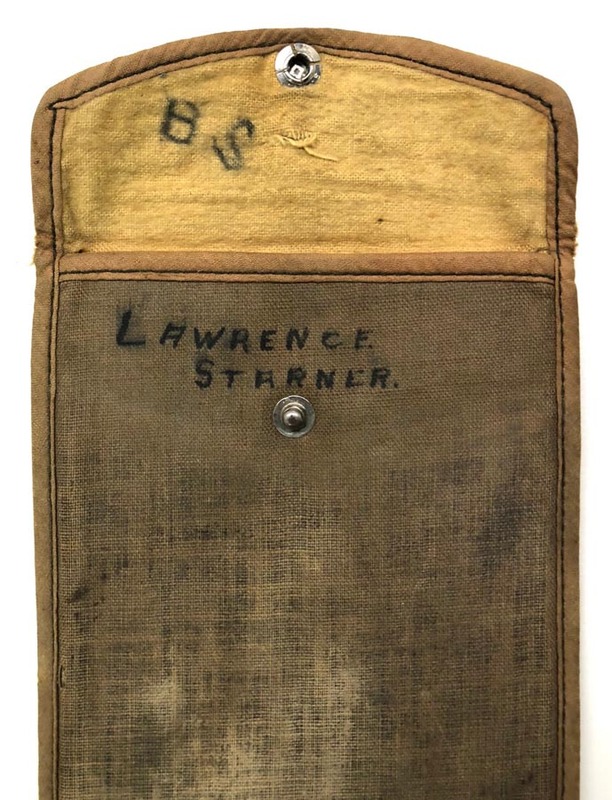 Interior flap is ink stamped : L.C.C. 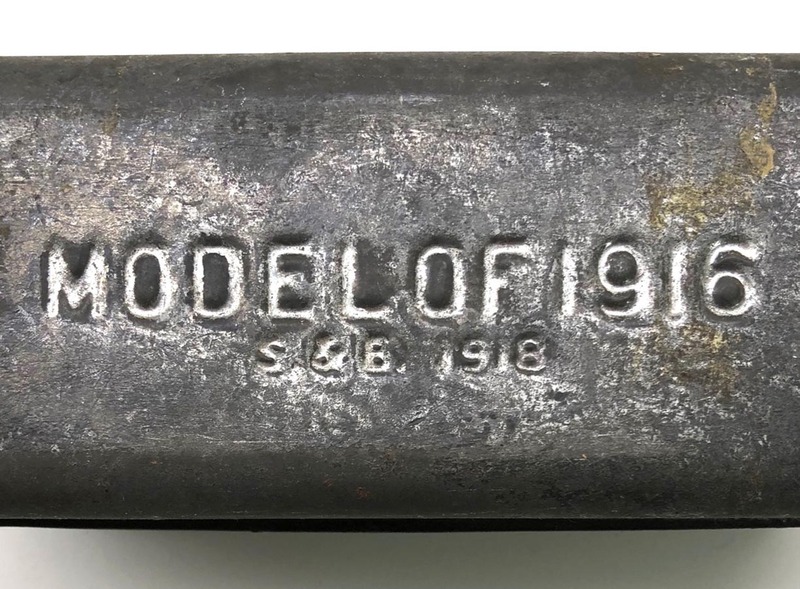 & Co. 1918. 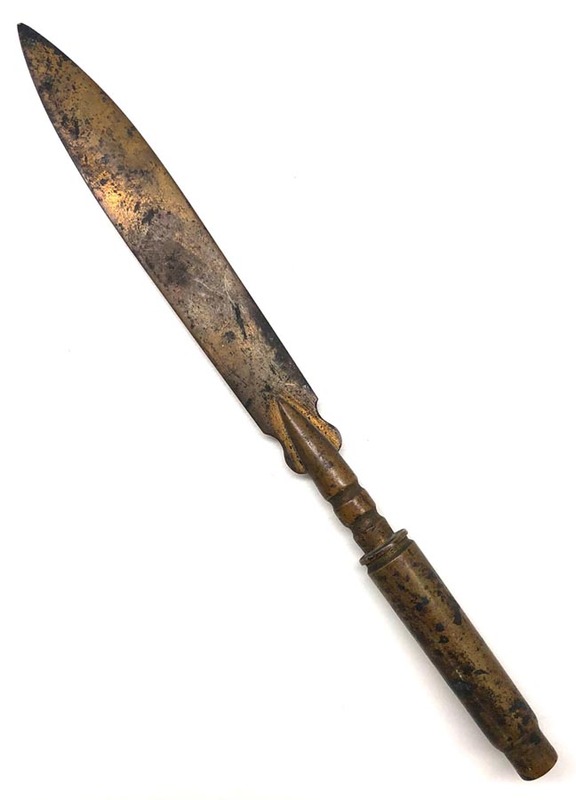 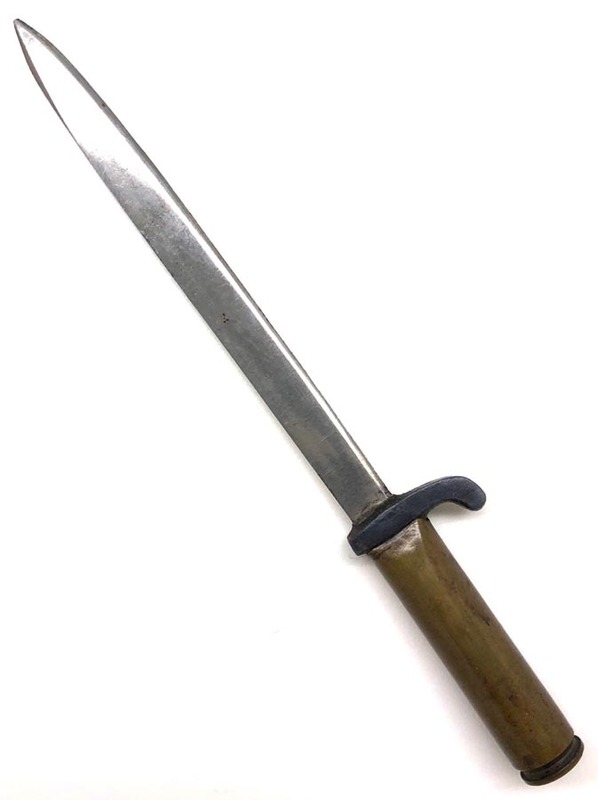 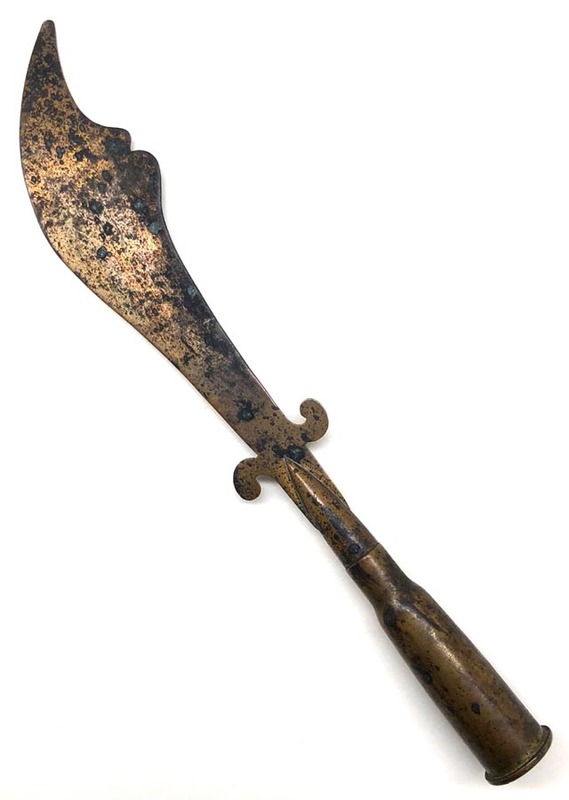 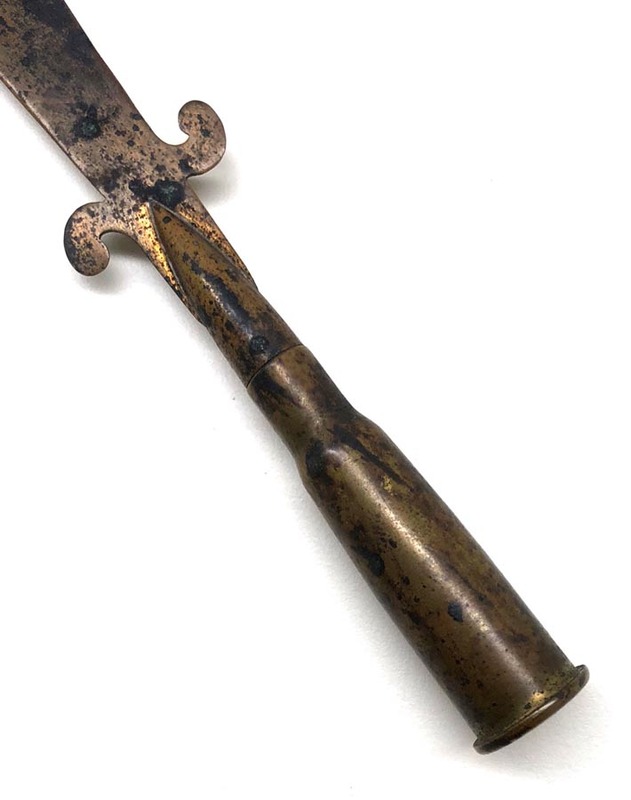 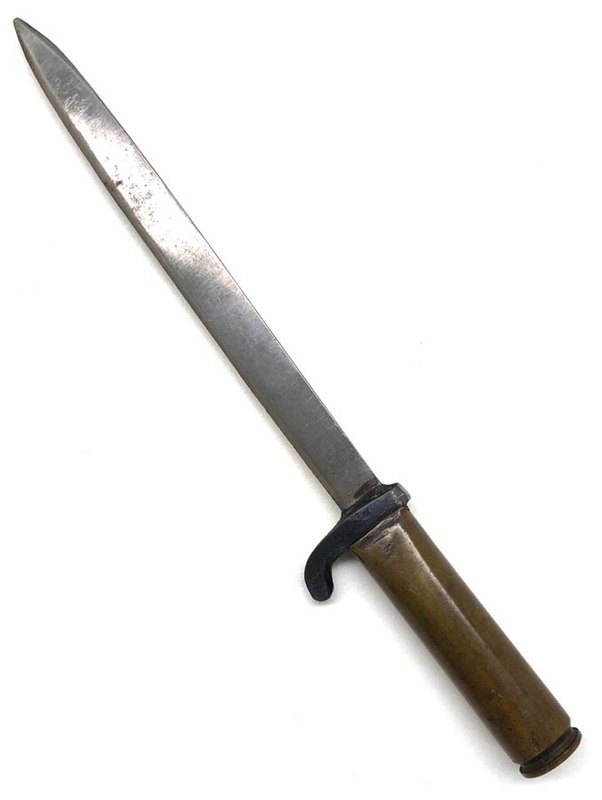 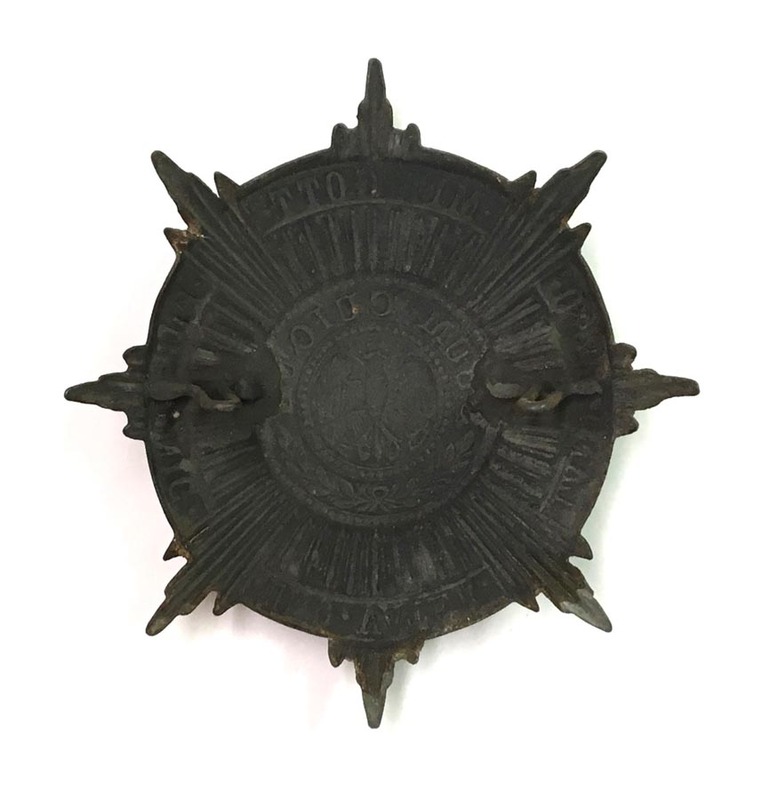 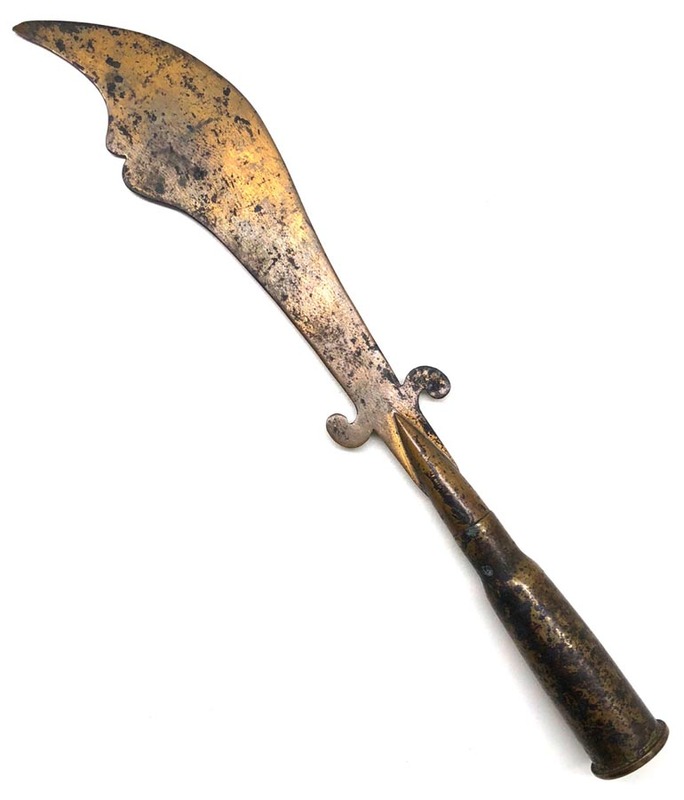 PHYSICAL DESCRIPTION: This WW1 US Trench Art Letter Opener is in nice condition showing some age. 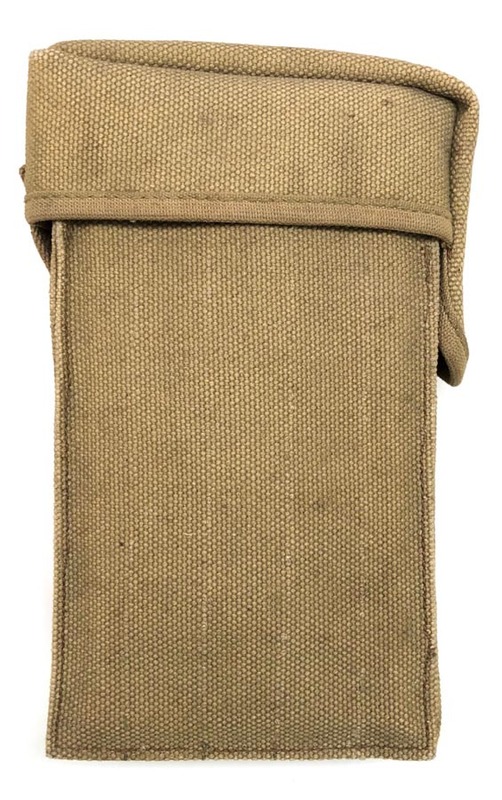 No dings or dents , nicely made. 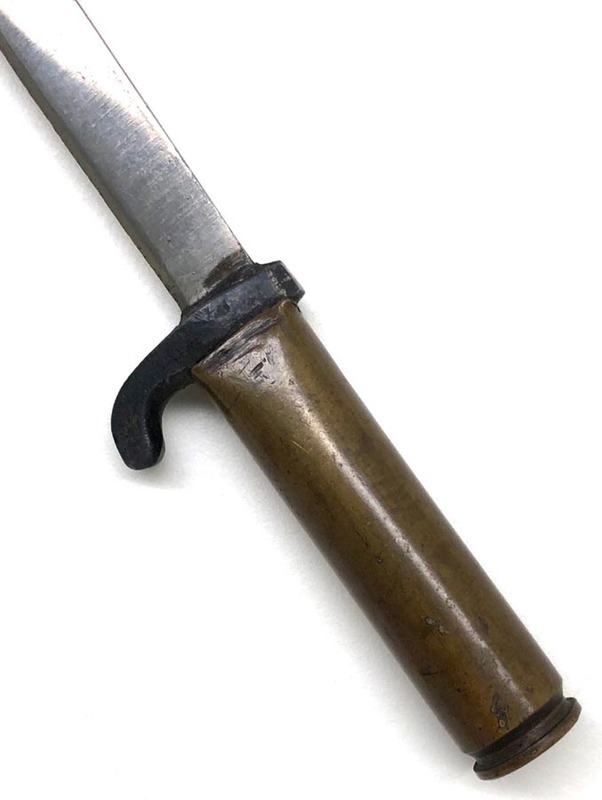 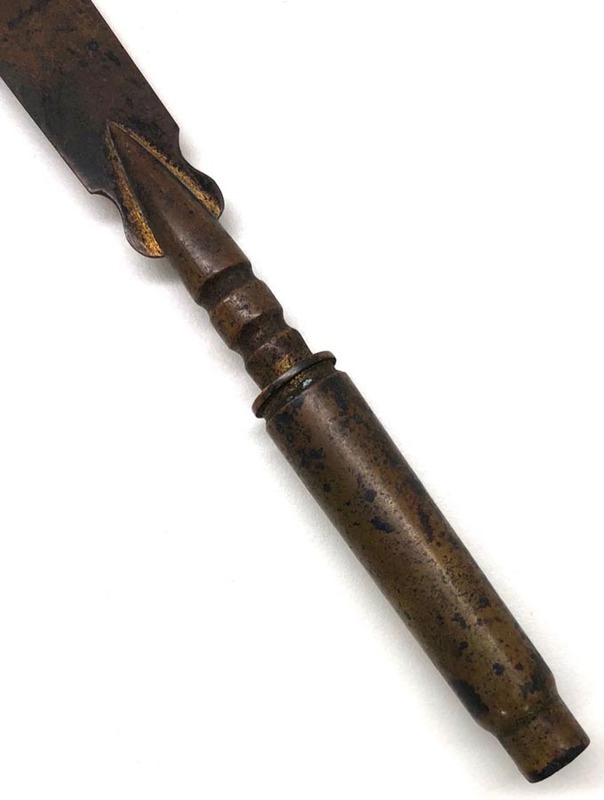 PHYSICAL DESCRIPTION: This WW1 US Trench Art Bullet Letter Opener is in nice condition showing some age and soiling. 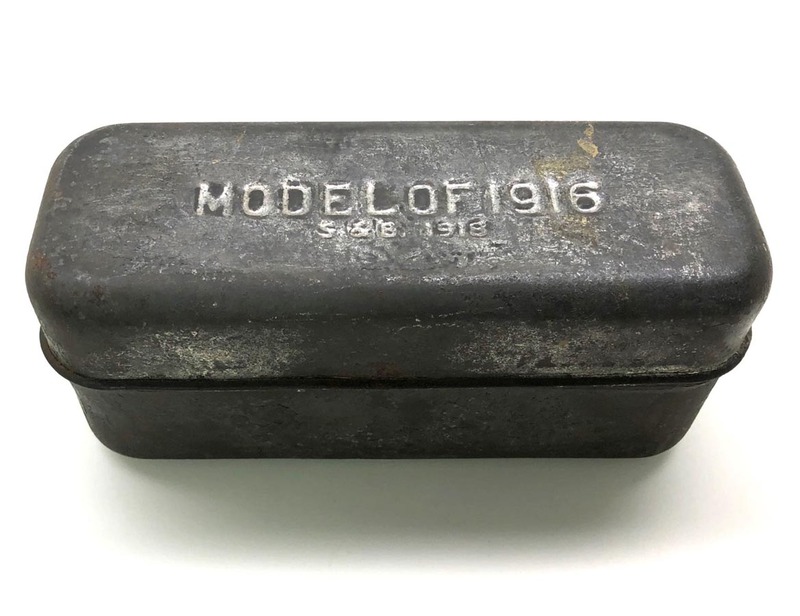 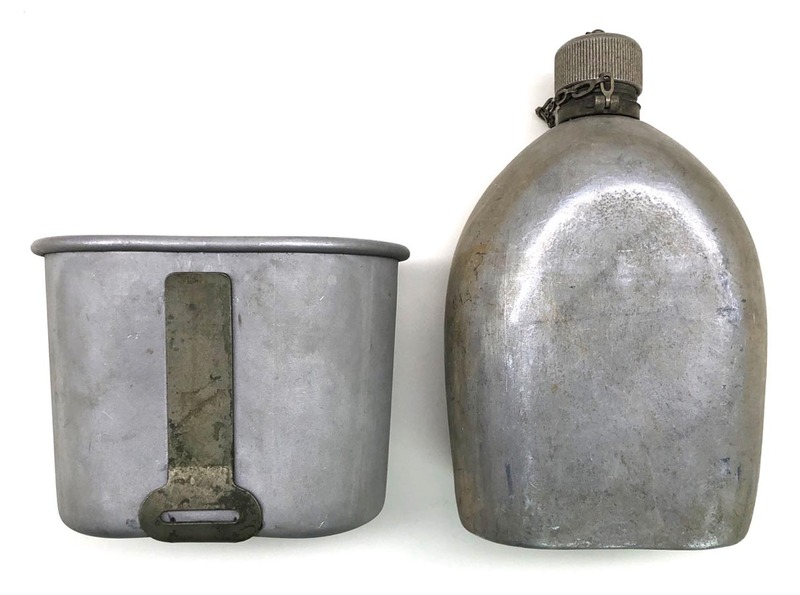 PHYSICAL DESCRIPTION: This WW1 US Bacon Tin is in nice condition showing some age and soiling. 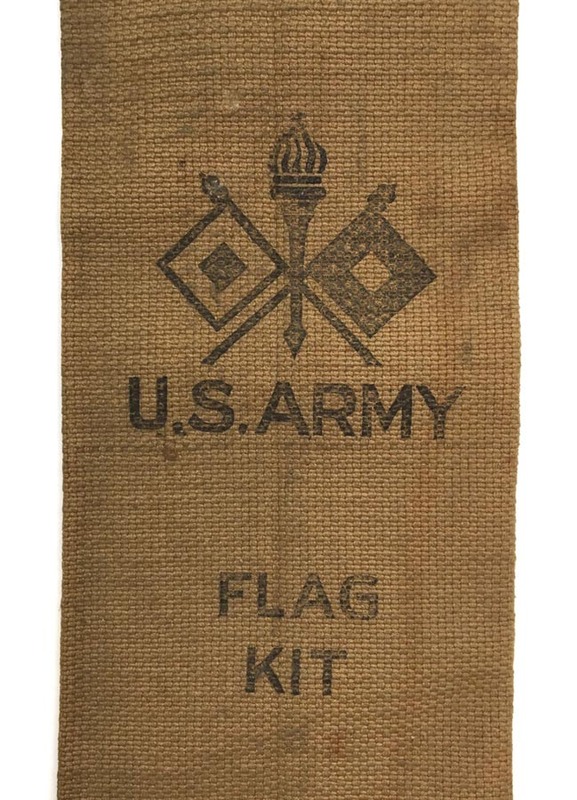 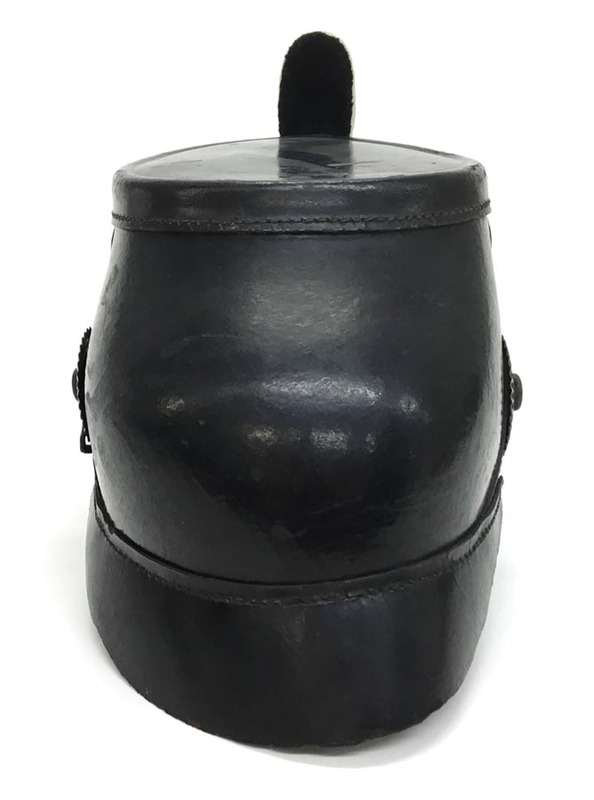 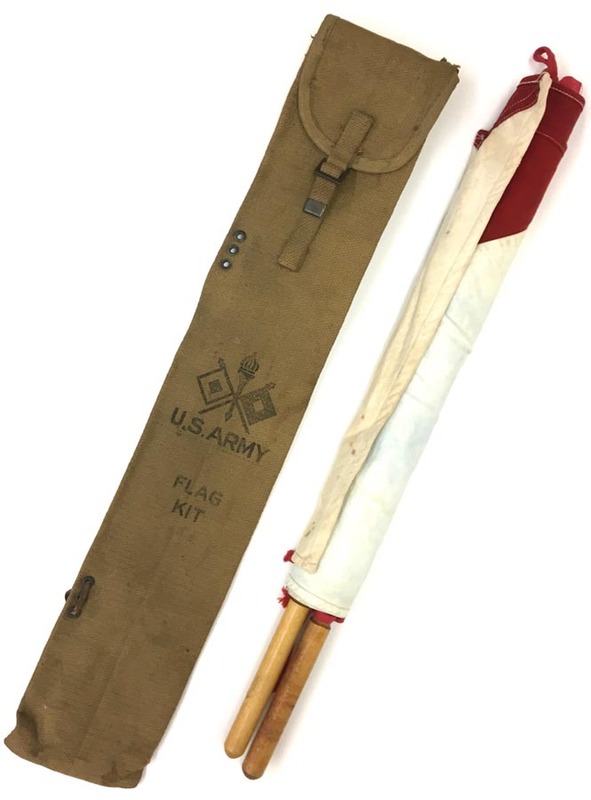 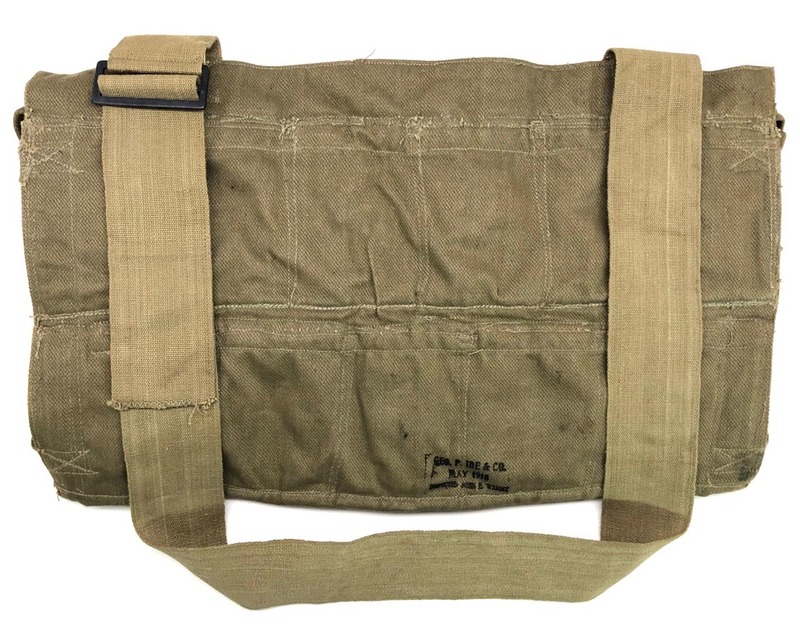 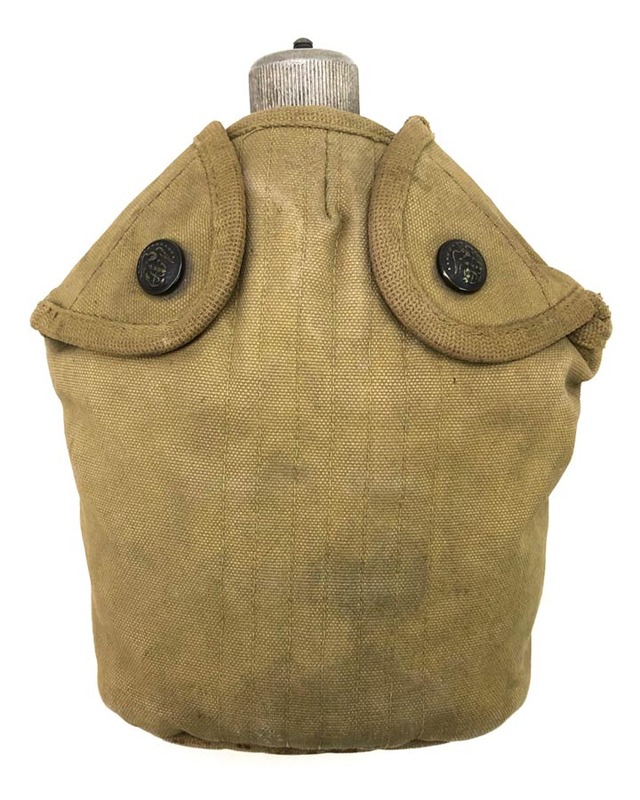 PHYSICAL DESCRIPTION: This WW1 US Ditty Bag is in nice condition showing some age and wear. 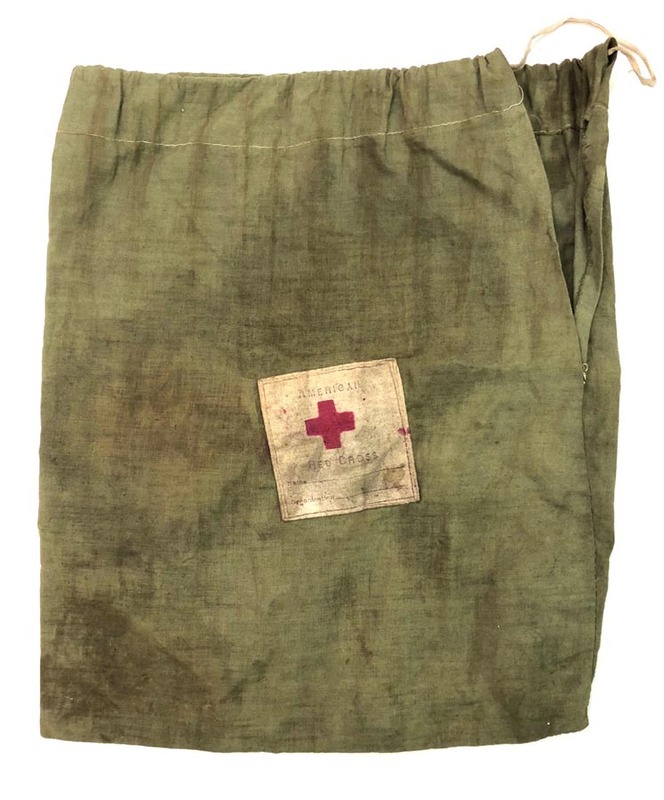 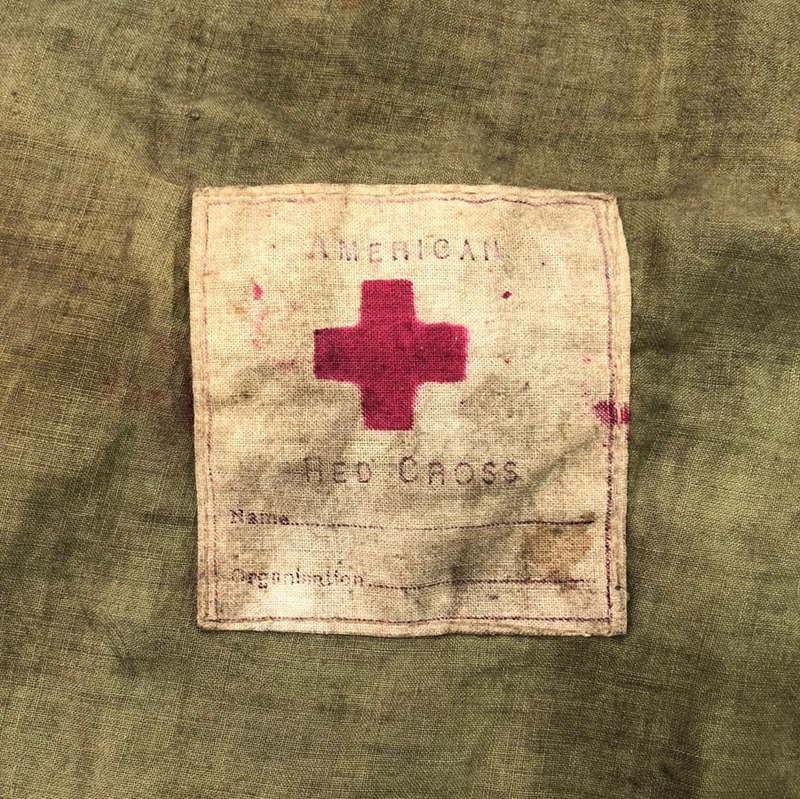 Ditty bag has an American Red Cross label to front. 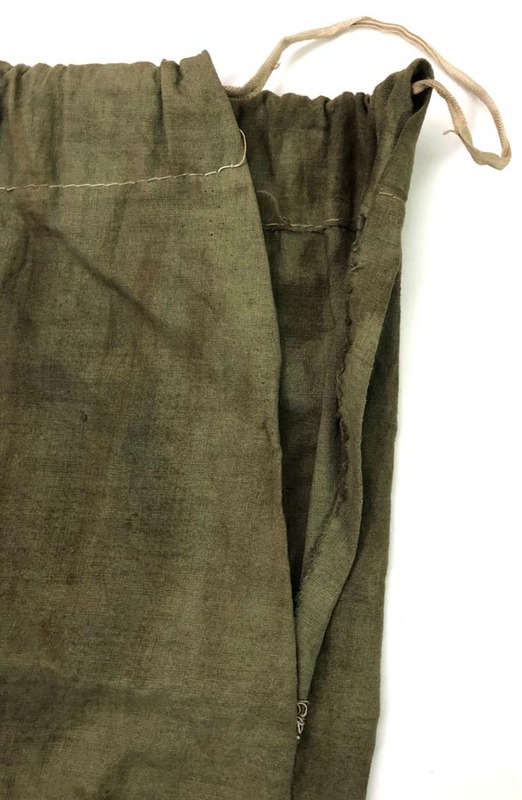 Some of the side seam to right side has come undone. 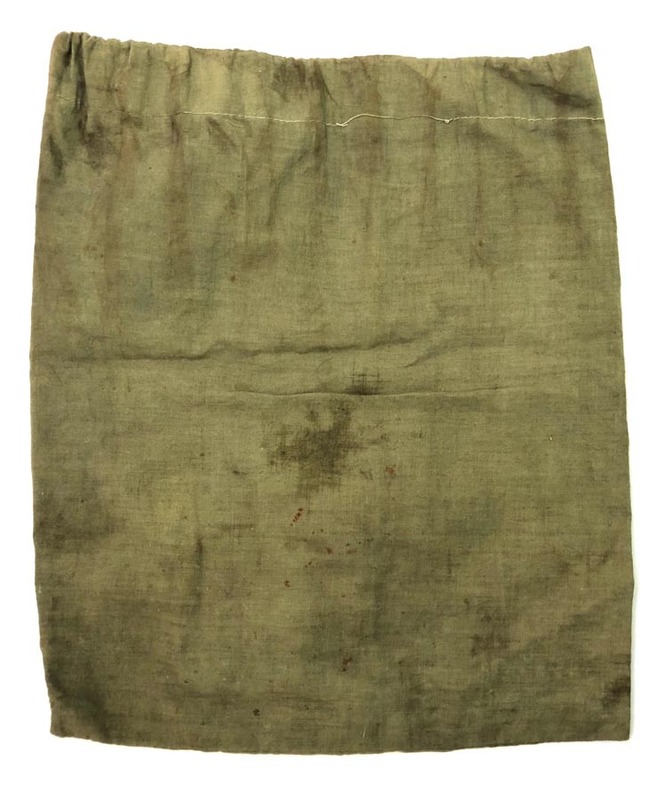 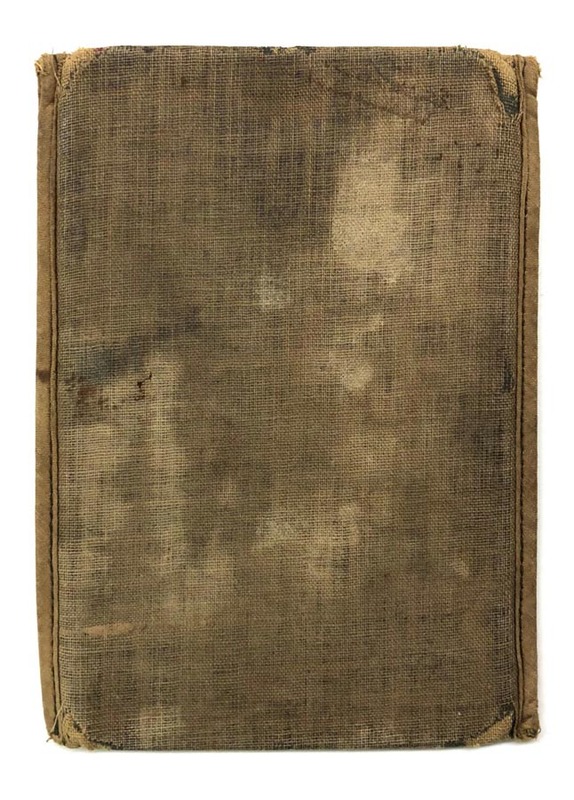 Bag shows some soiling. 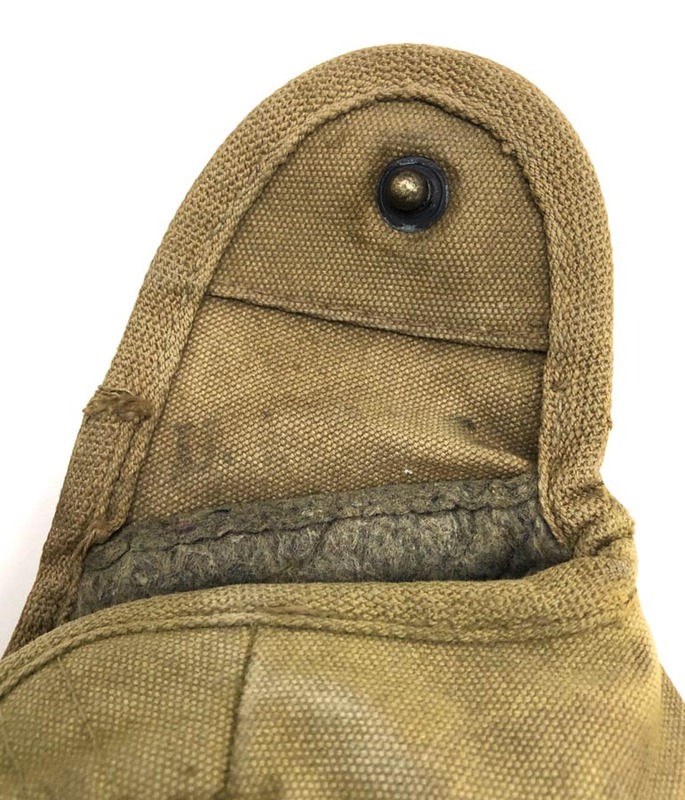 No holes or other damage. 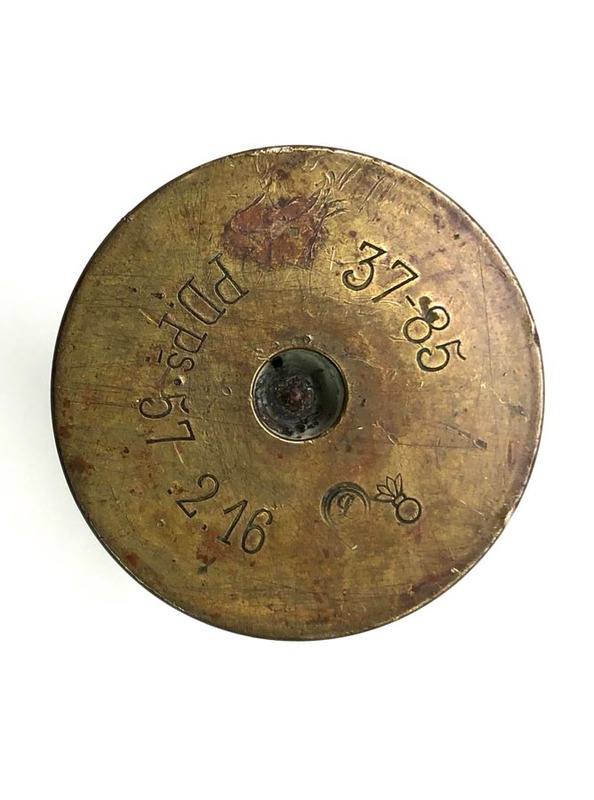 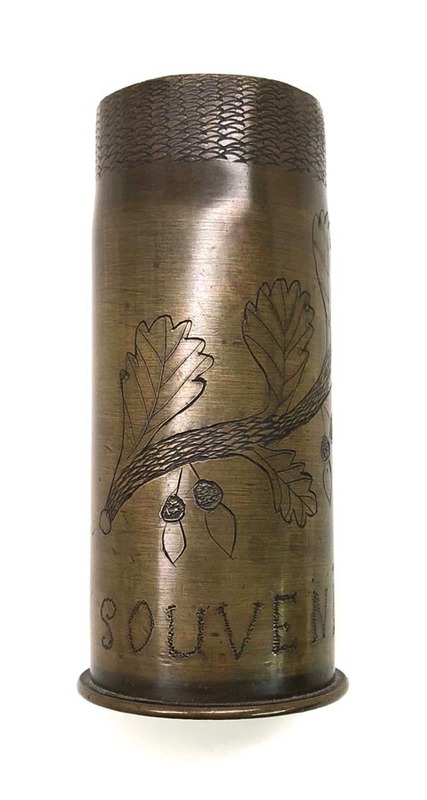 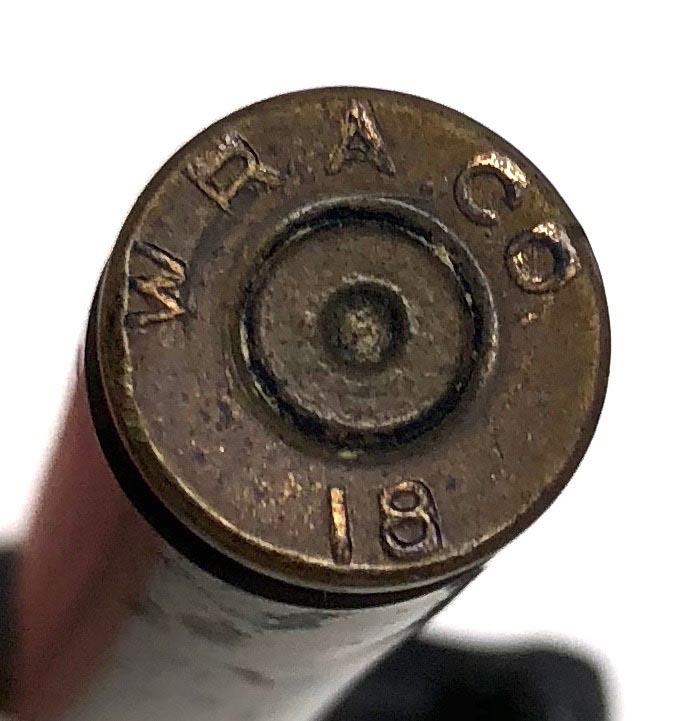 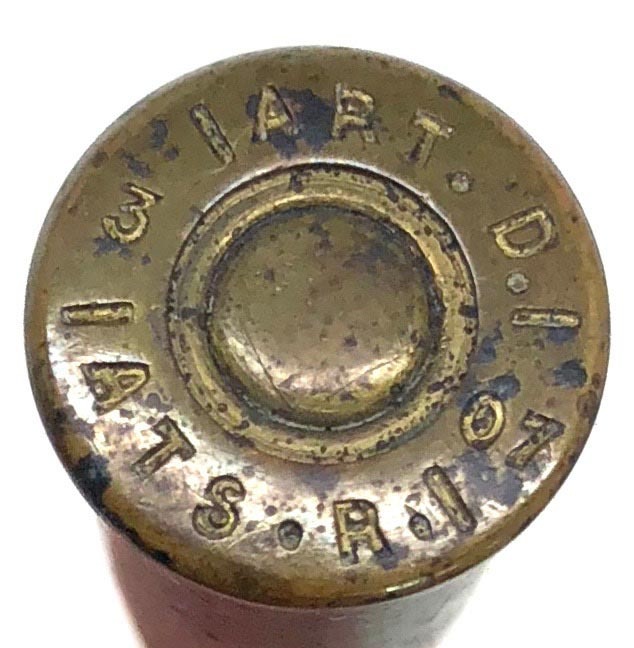 PHYSICAL DESCRIPTION: This WW1 37mm "Souvenir" Trench Art Shell is in real nice condition with no dents or damage. 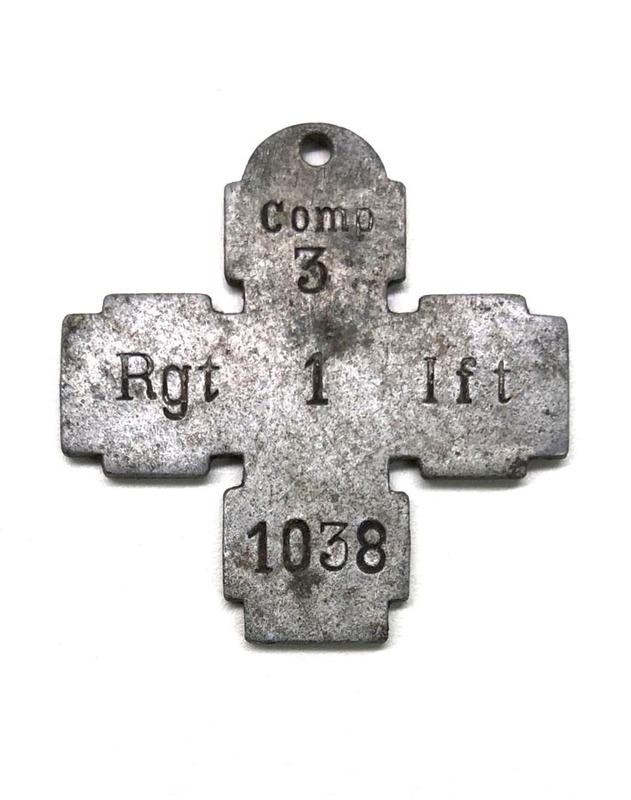 PHYSICAL DESCRIPTION: This WW1 Romanian Dog Tag is in nice condition showing some age. 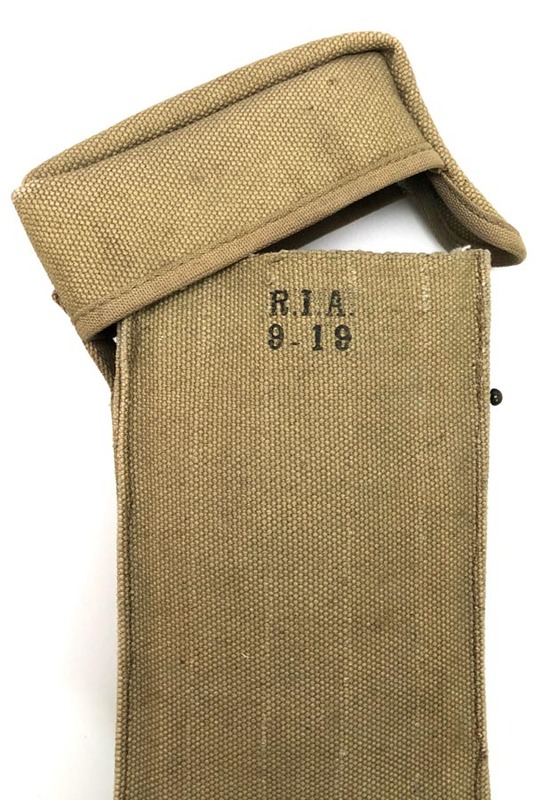 WW1 U.S. Pederson Magazine Pouch R.I.A. 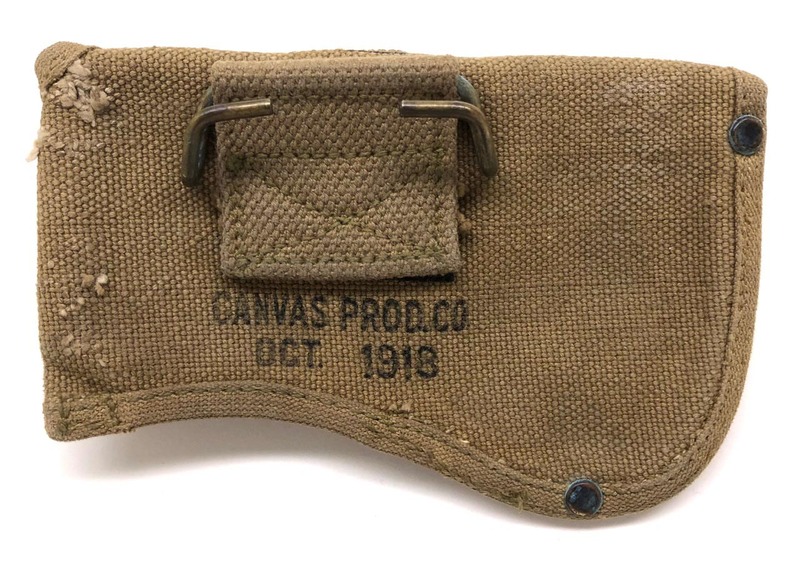 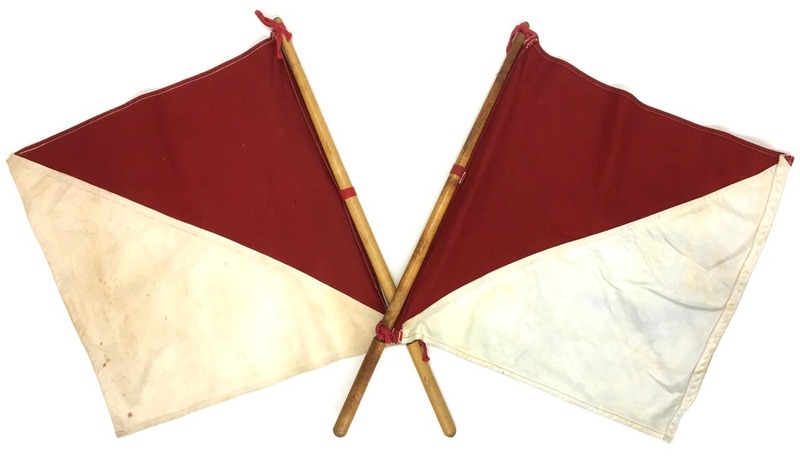 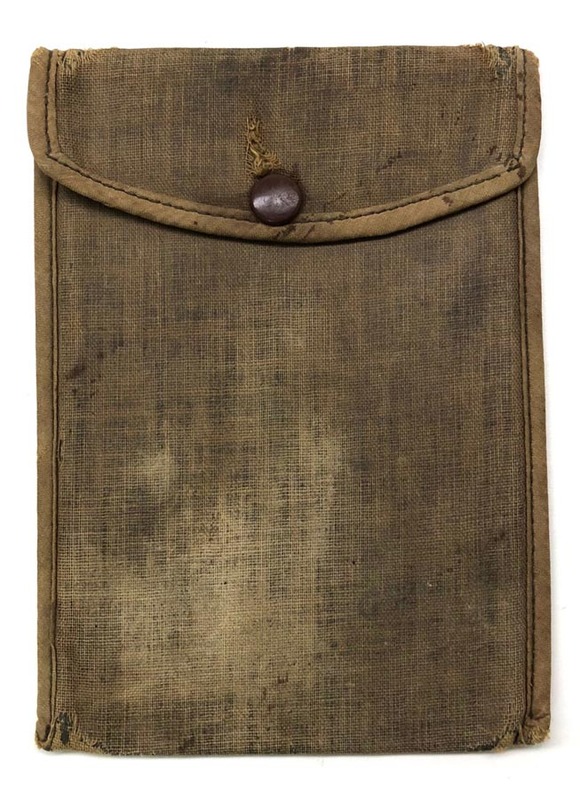 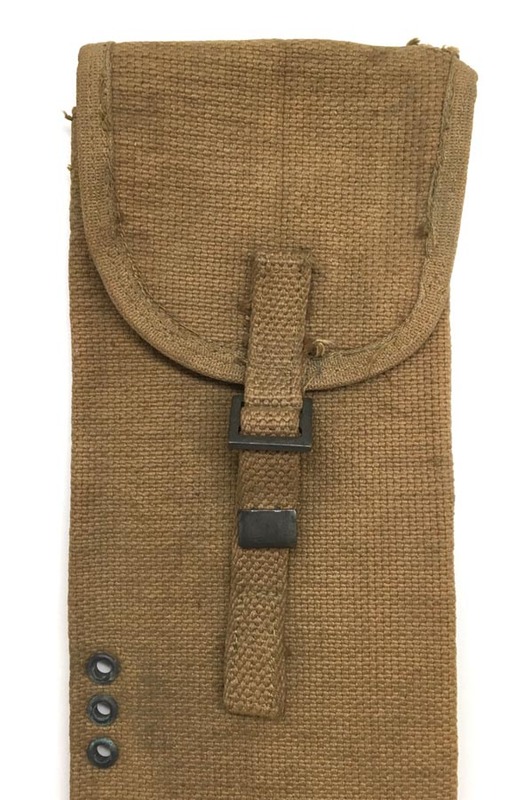 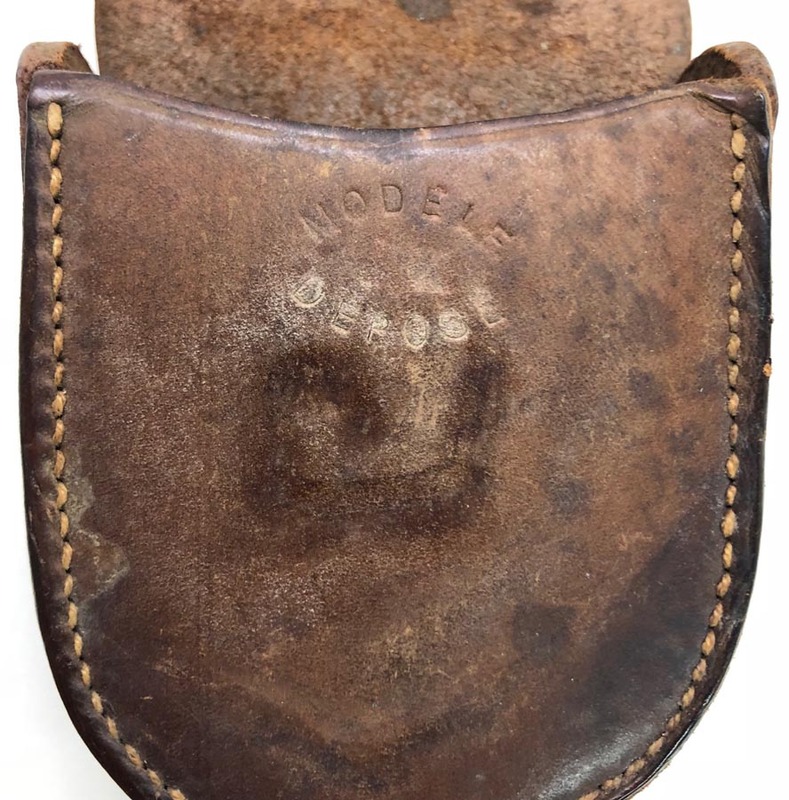 PHYSICAL DESCRIPTION: This WW1 U.S. Pederson Magazine Pouch is in mint unissued condition. 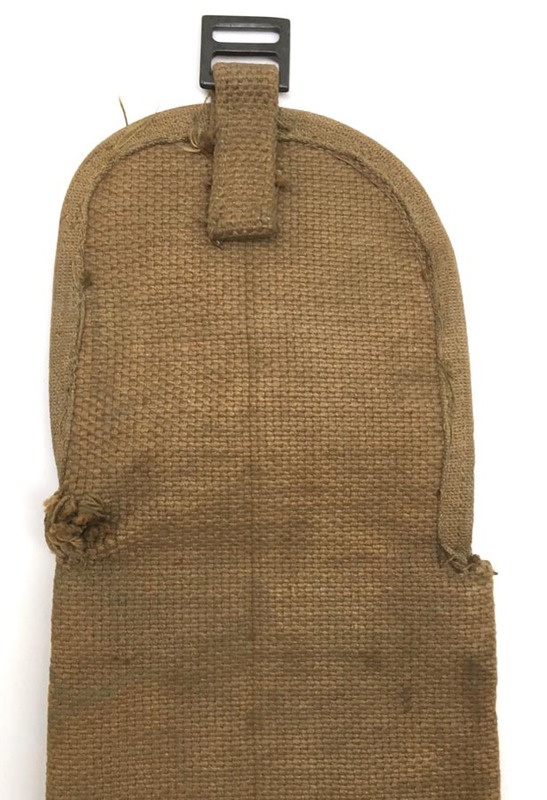 Pouch is R.I.A. 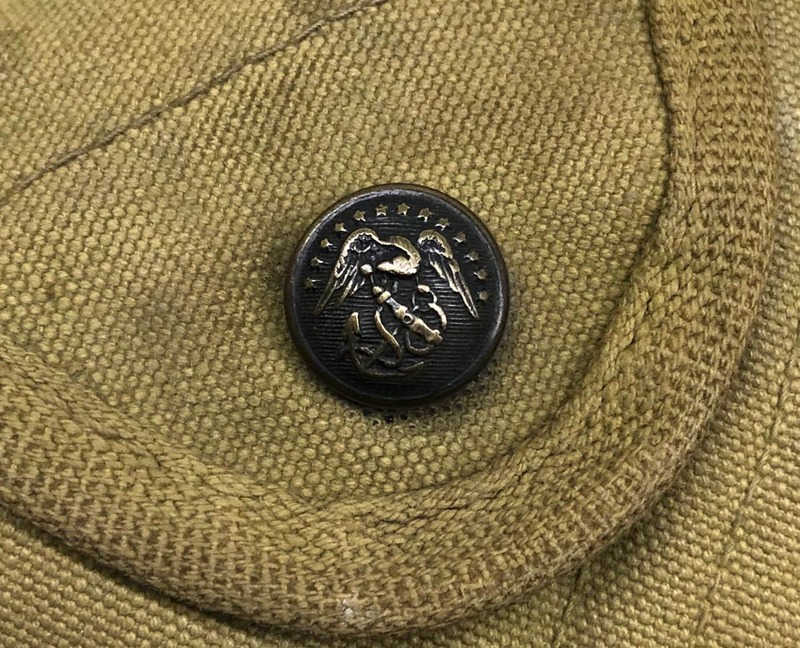 marked for Rock Island Arsenal. 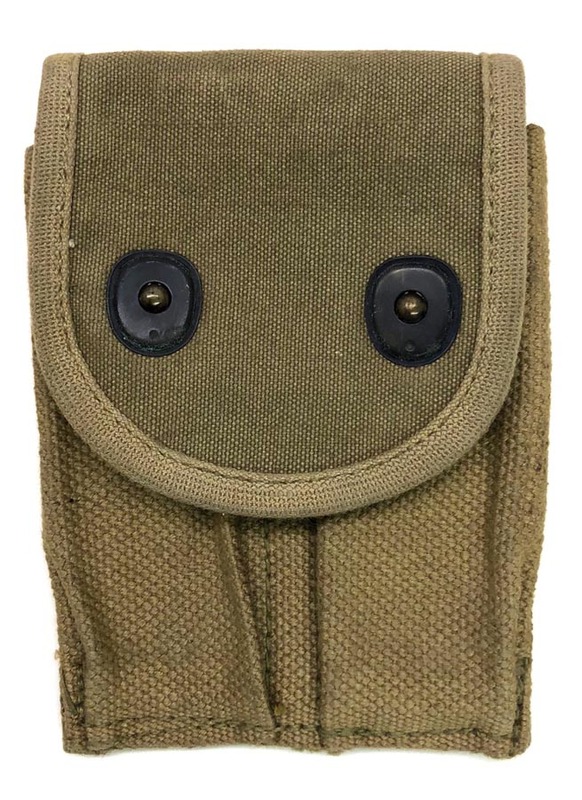 Closure snap functions great. 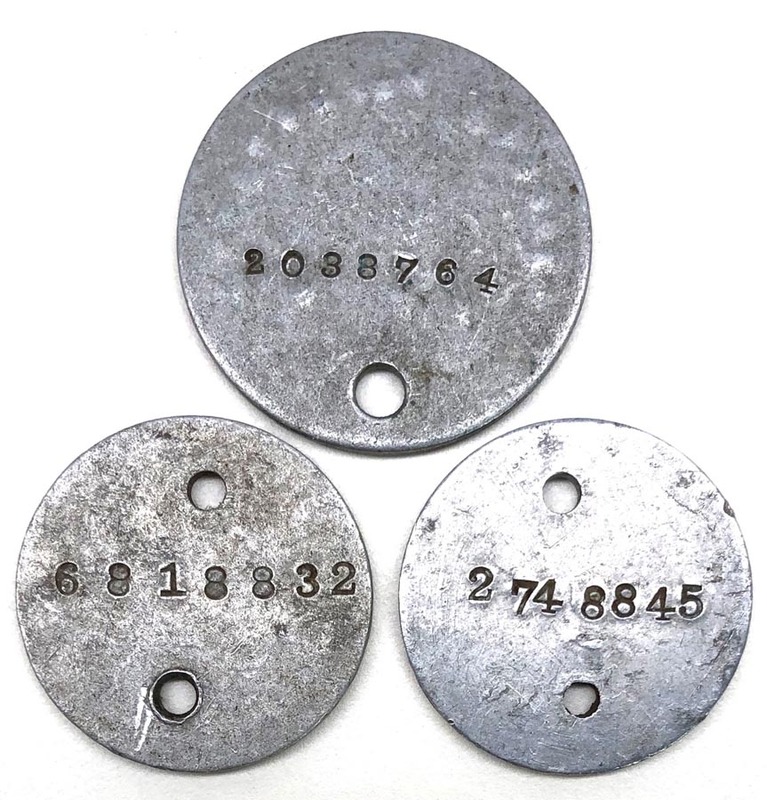 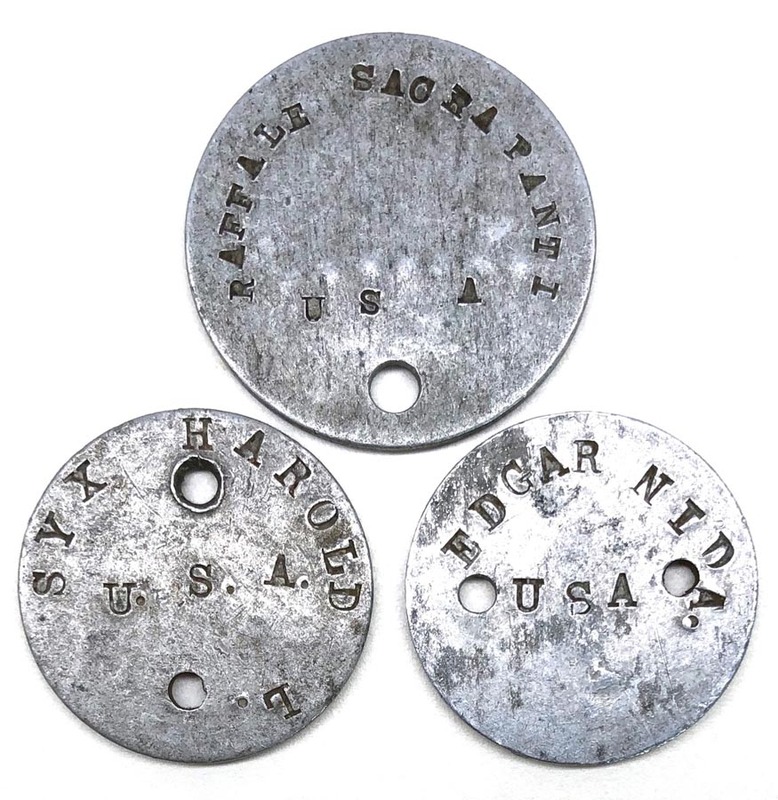 PHYSICAL DESCRIPTION: These 3 - WW1 US Dog Tags are in nice condition. 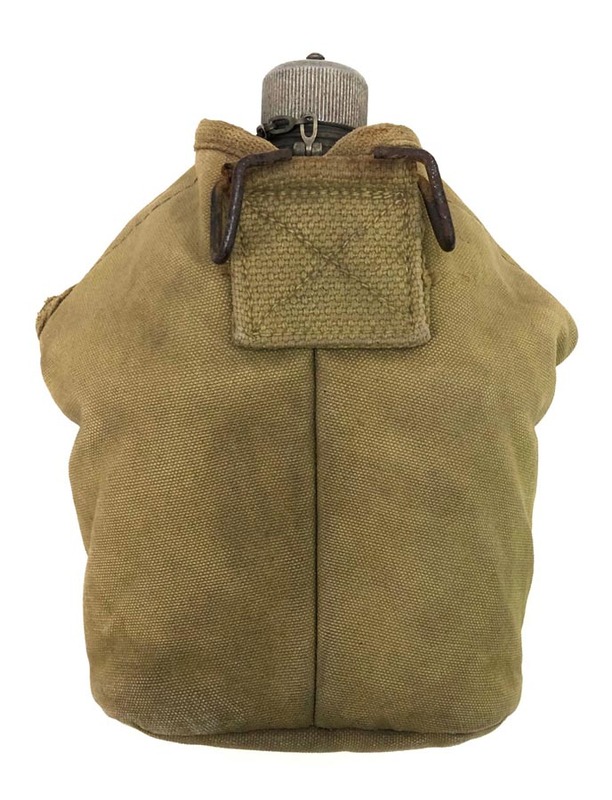 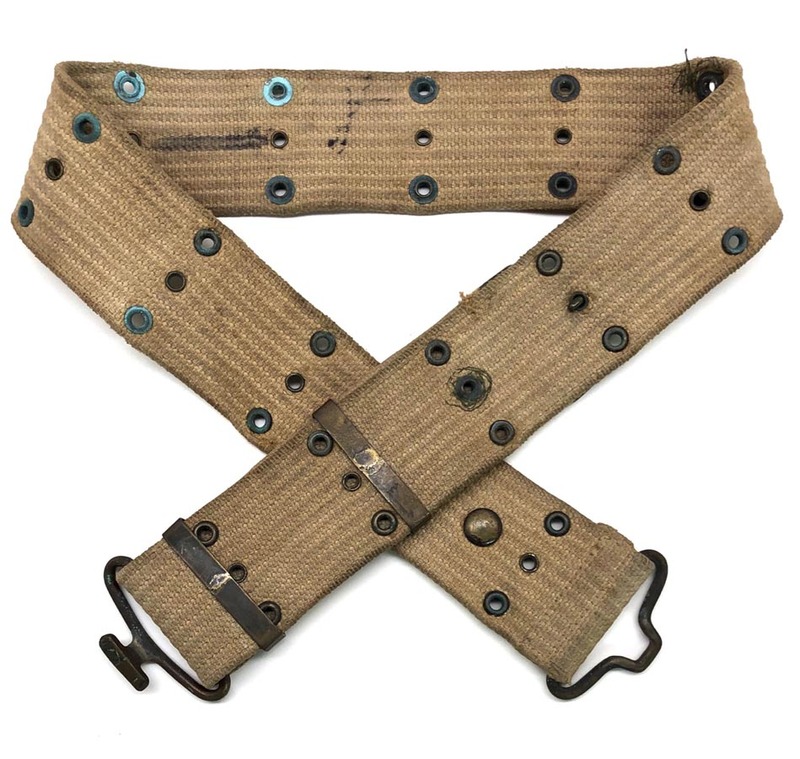 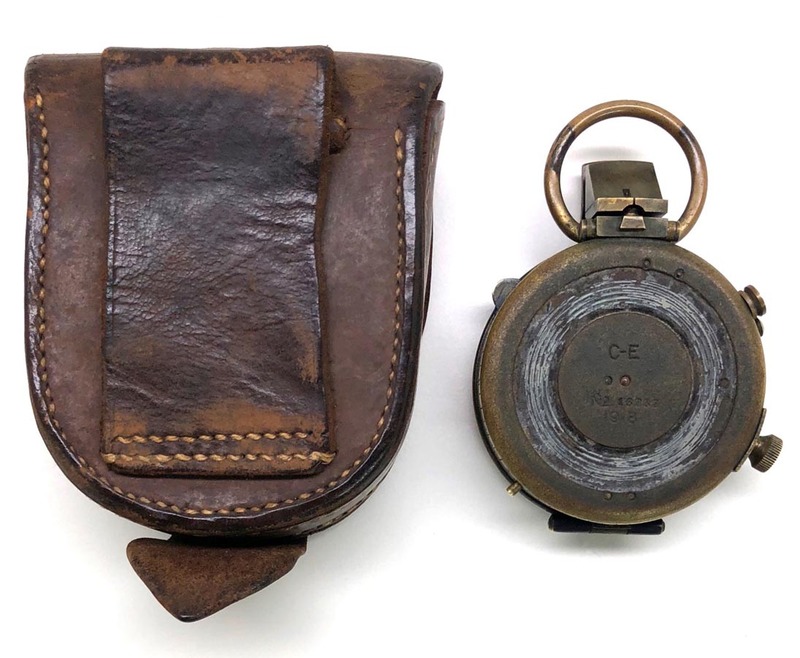 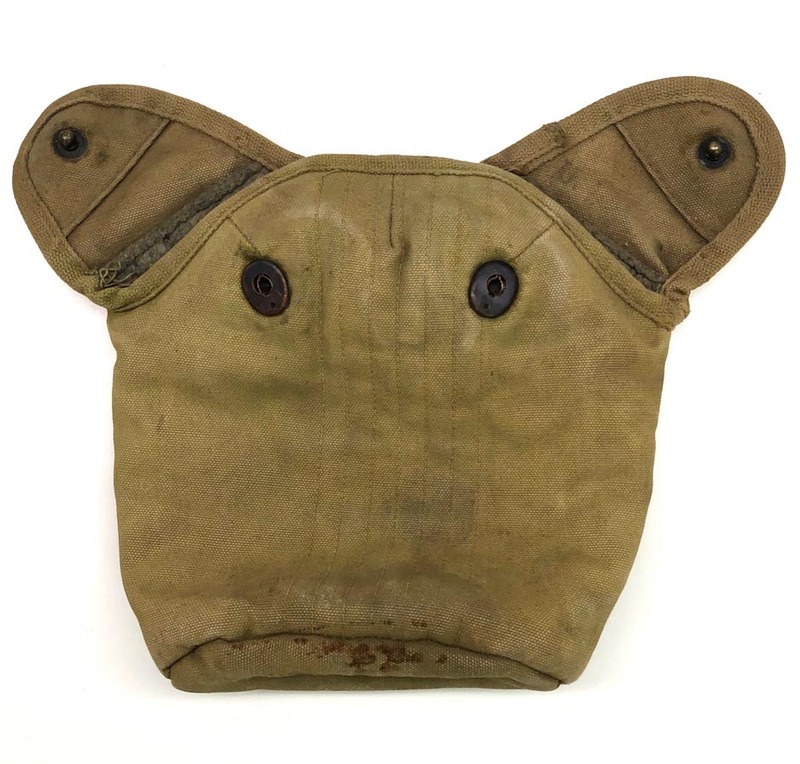 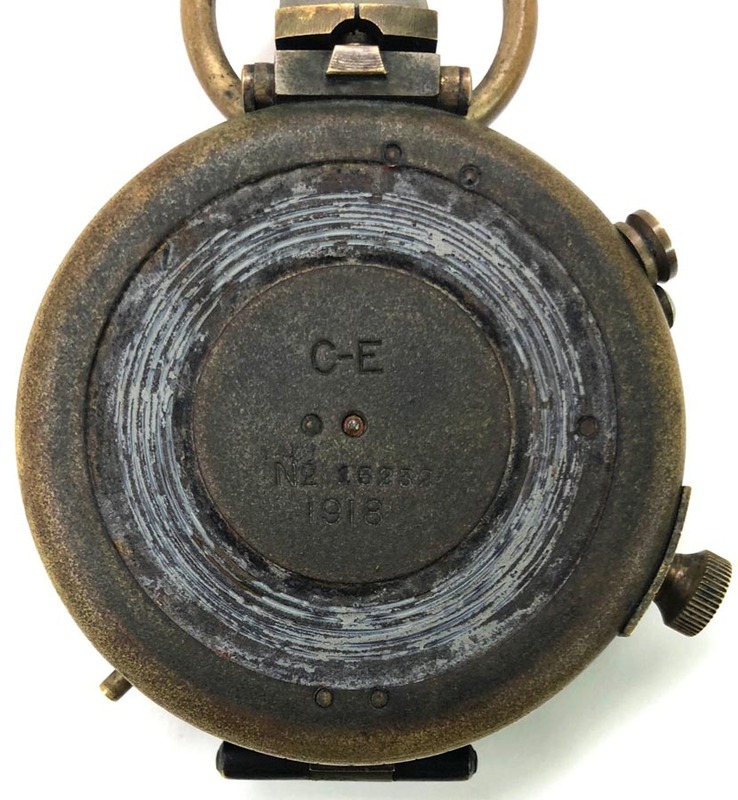 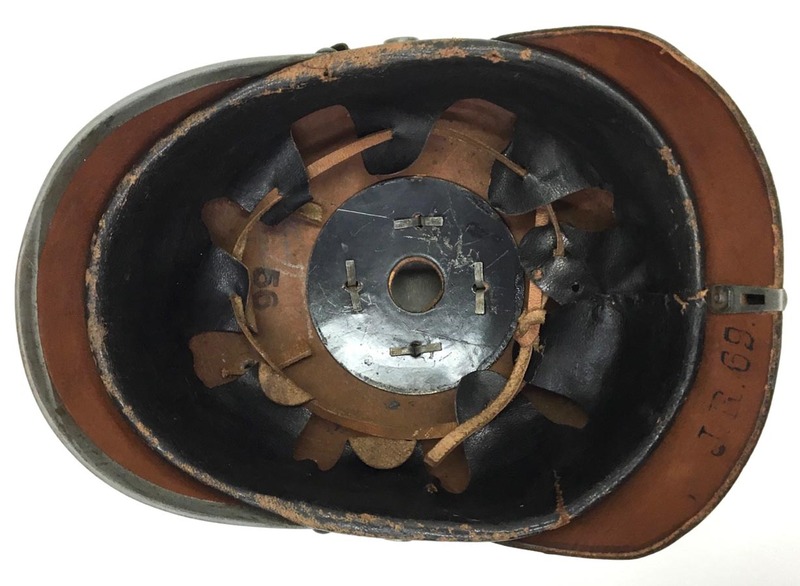 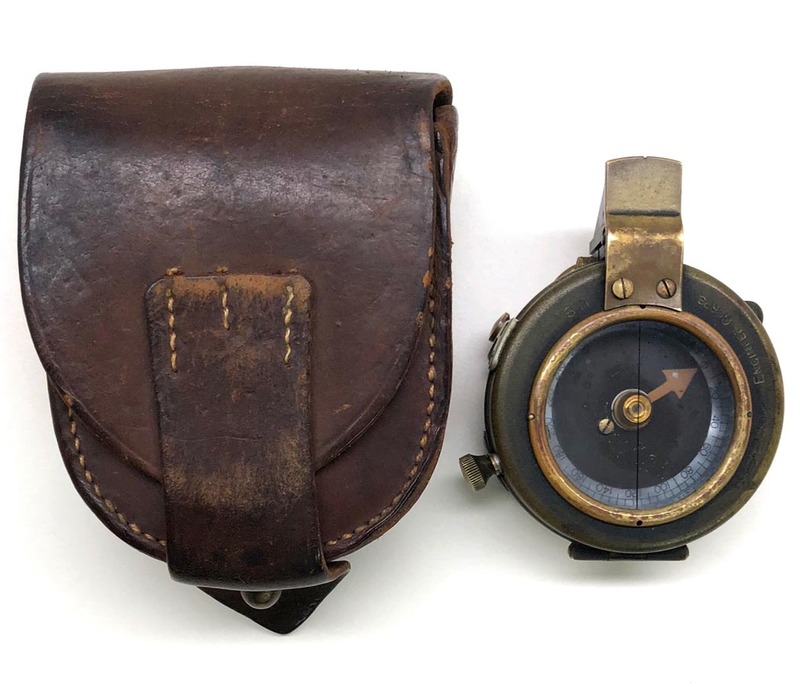 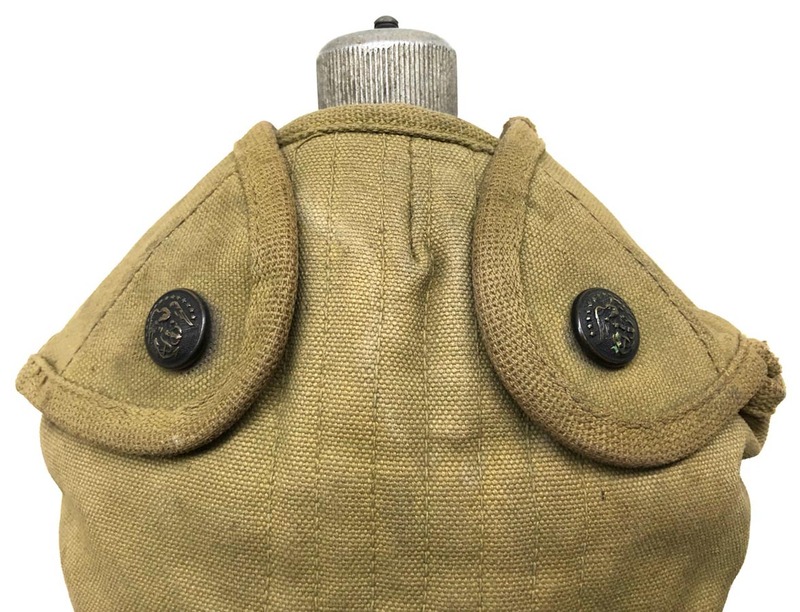 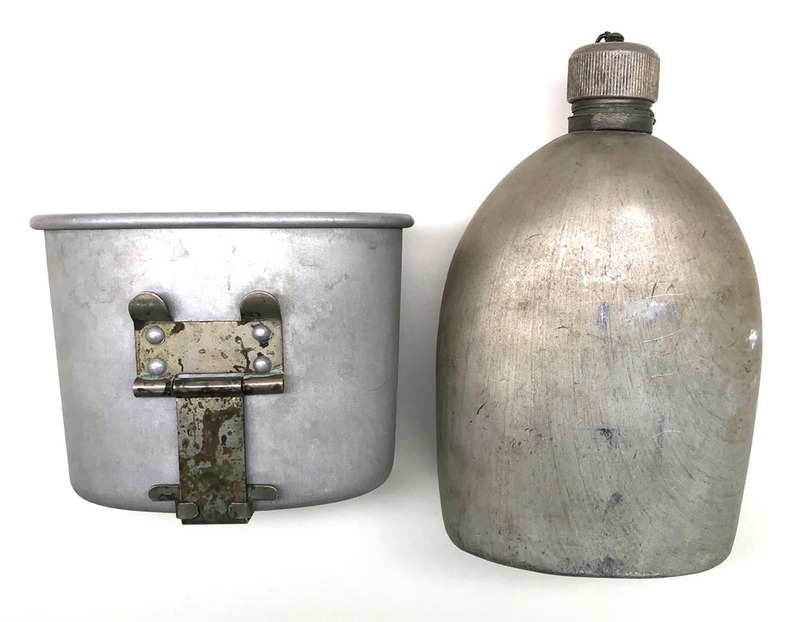 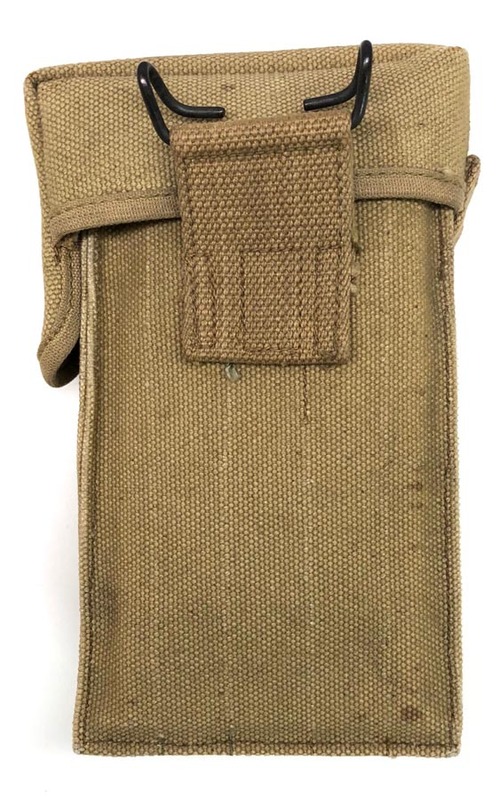 PHYSICAL DESCRIPTION: This WW1 US Grenade Vest is in mint unissued condition. 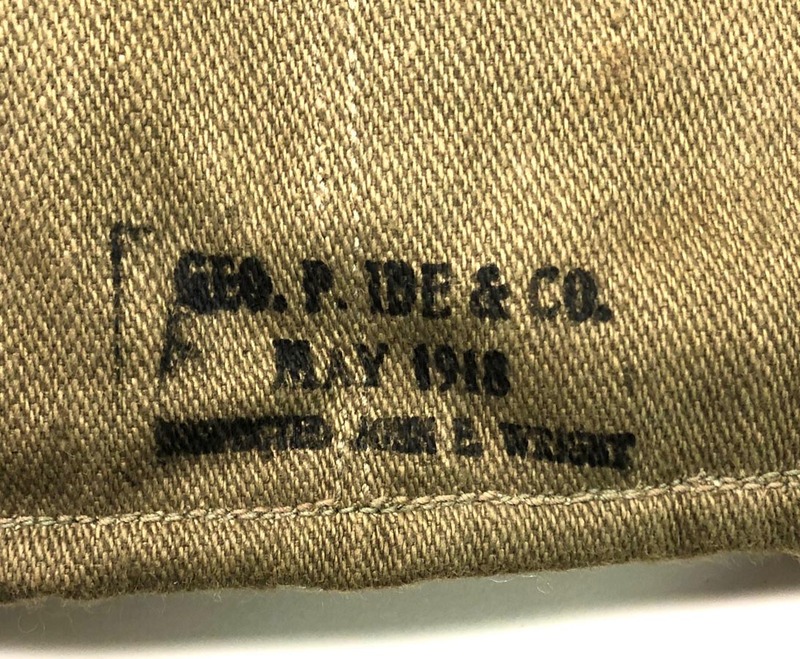 Vest is 1918 dated to backside. 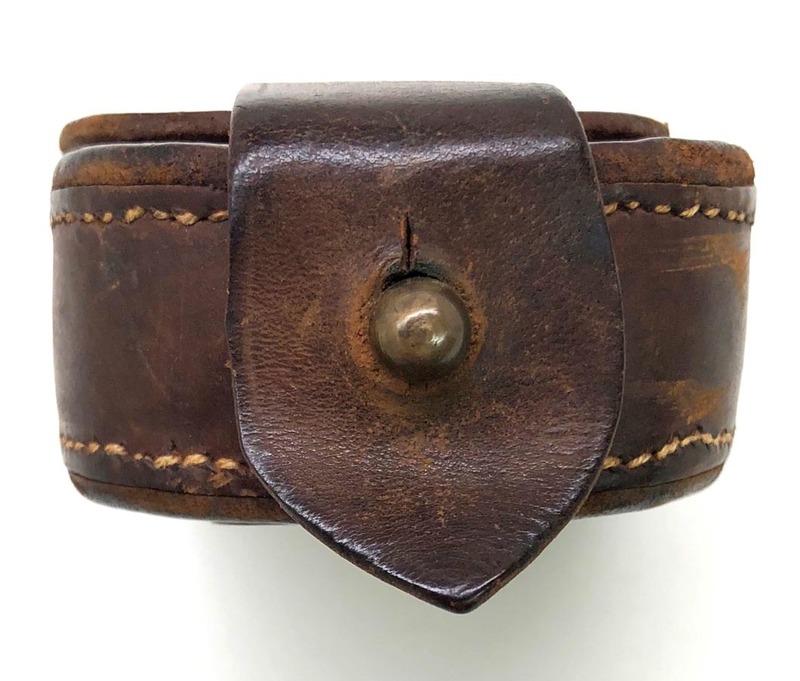 PHYSICAL DESCRIPTION: This WW1 US Web Pistol Belt is in fair condition showing some wear and age. 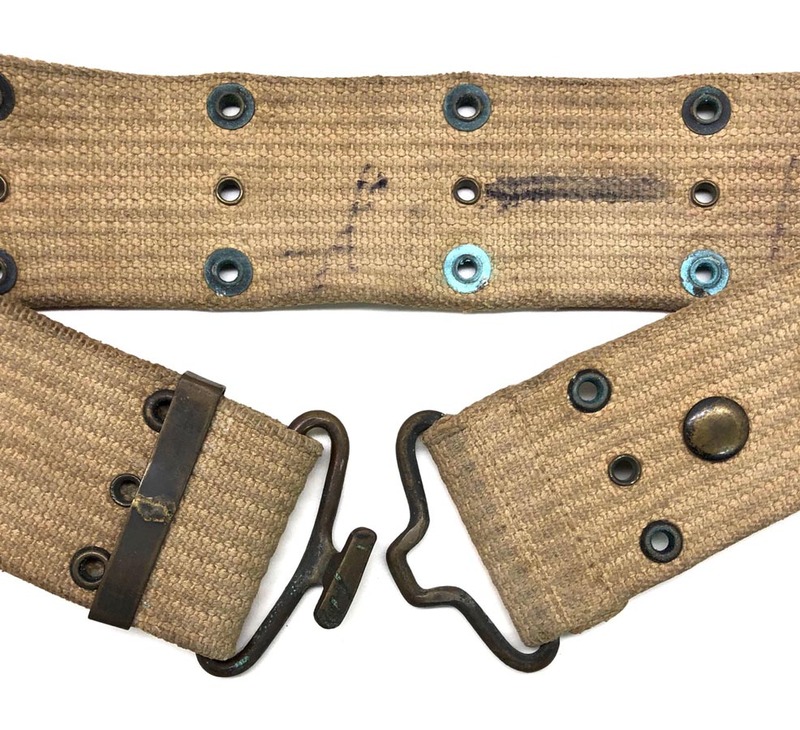 Belt is solid showing some vertigre to rivets. 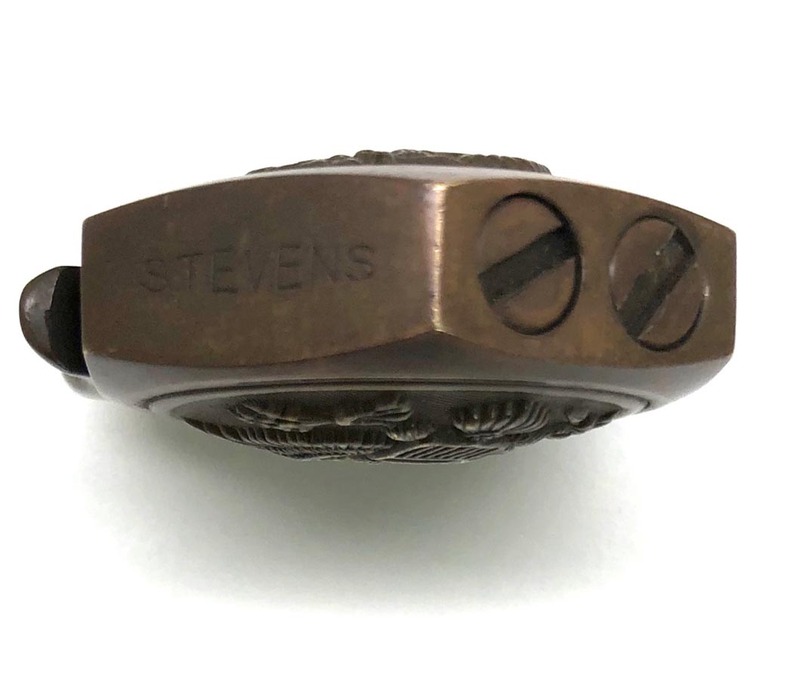 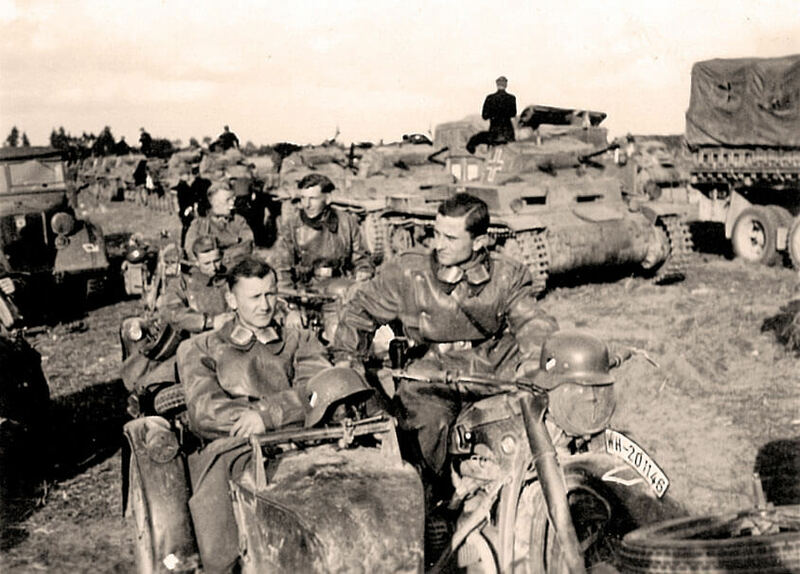 A couple of the rivets have been period reinforced. 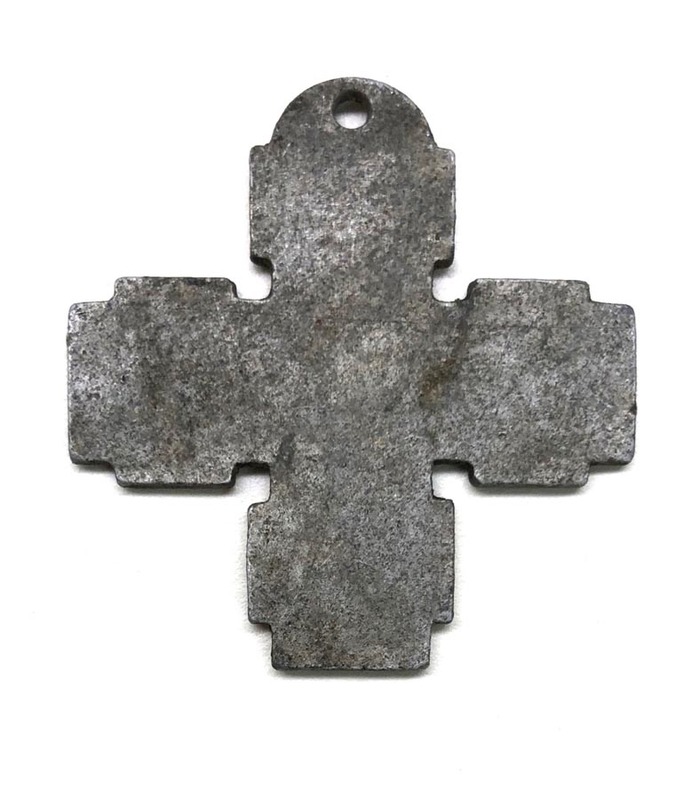 PHYSICAL DESCRIPTION: This Tschako frontplate is in great condition showing some light wear and age. 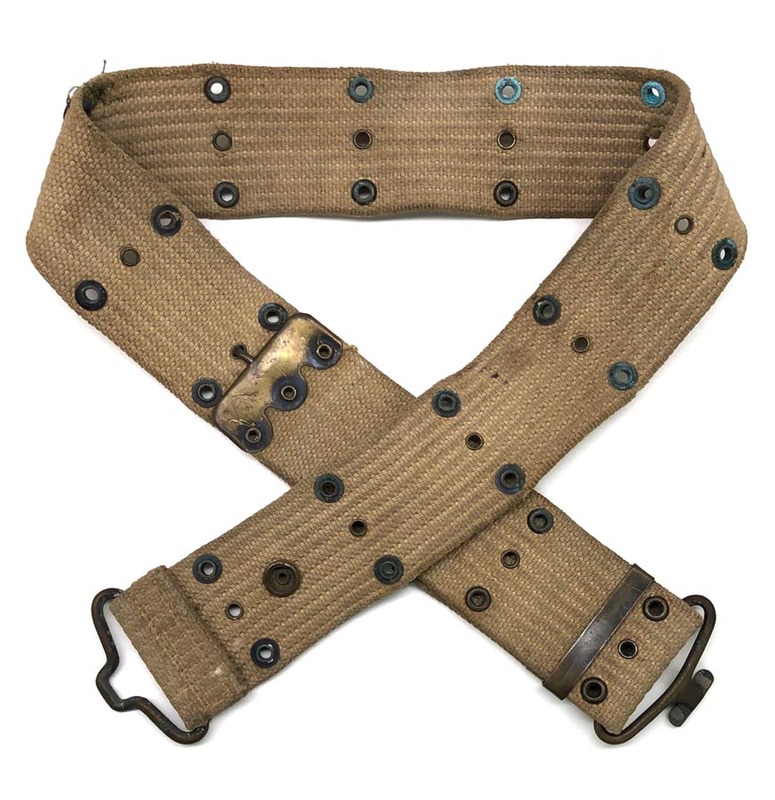 Both mounting loops are present to reverse. 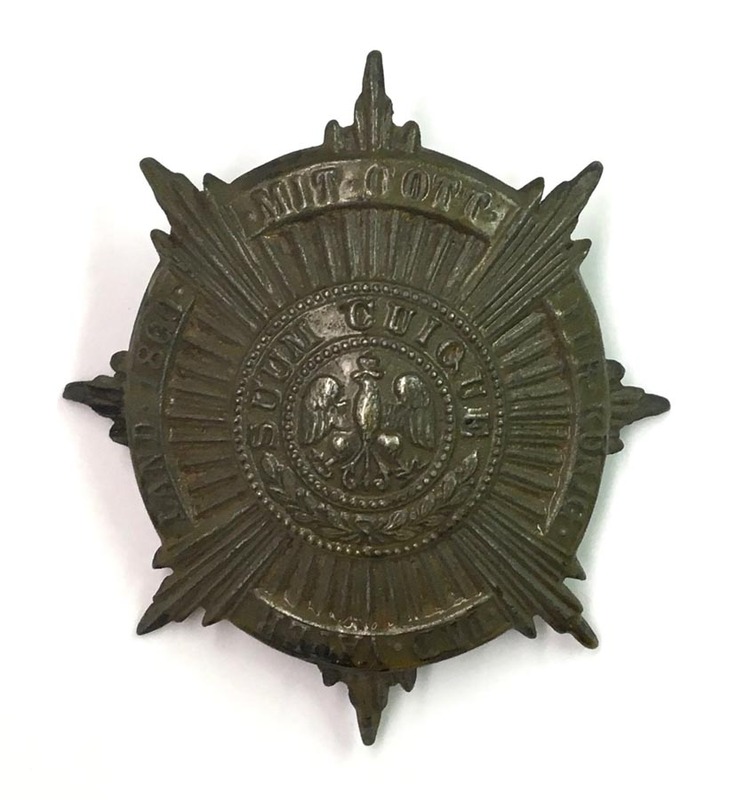 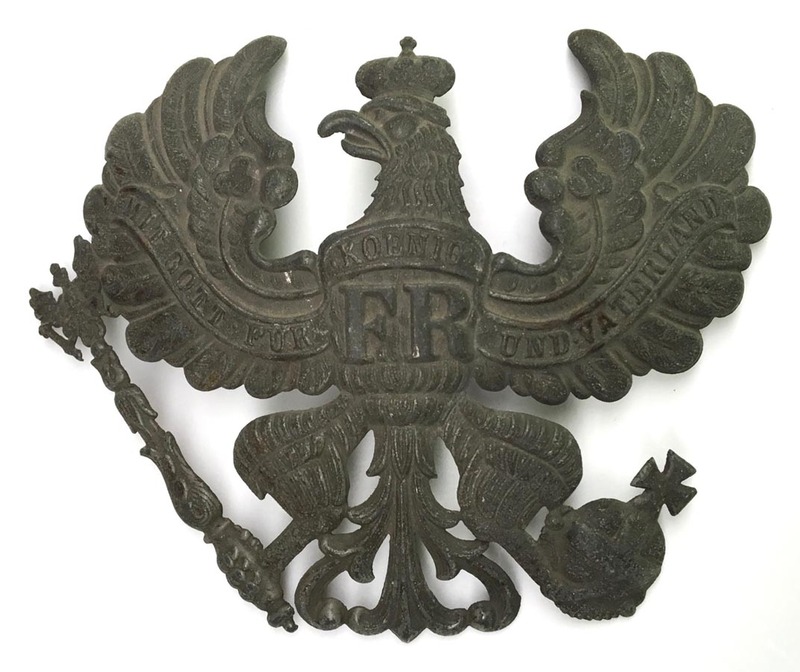 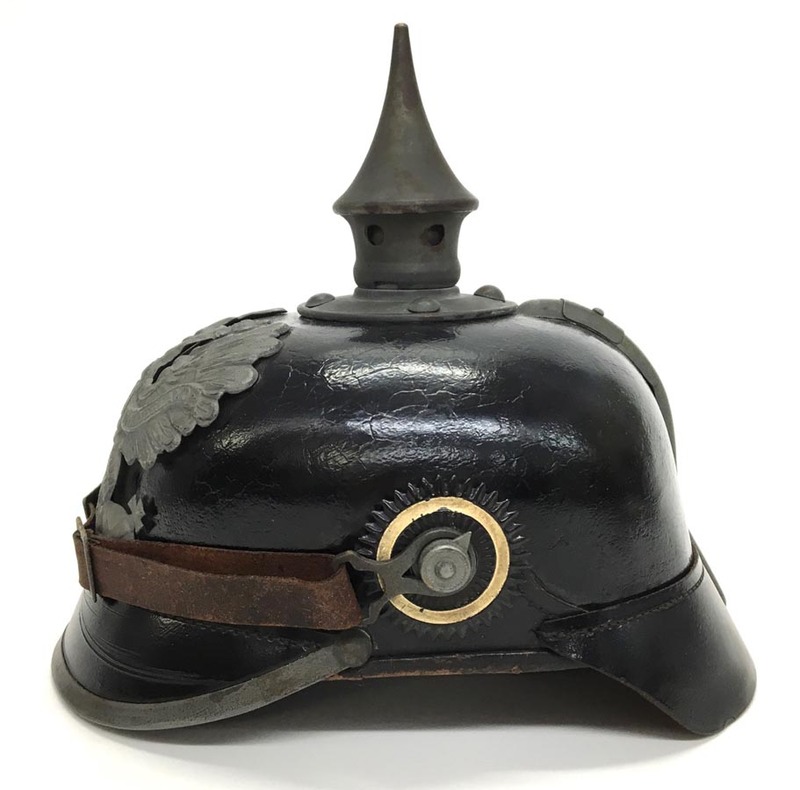 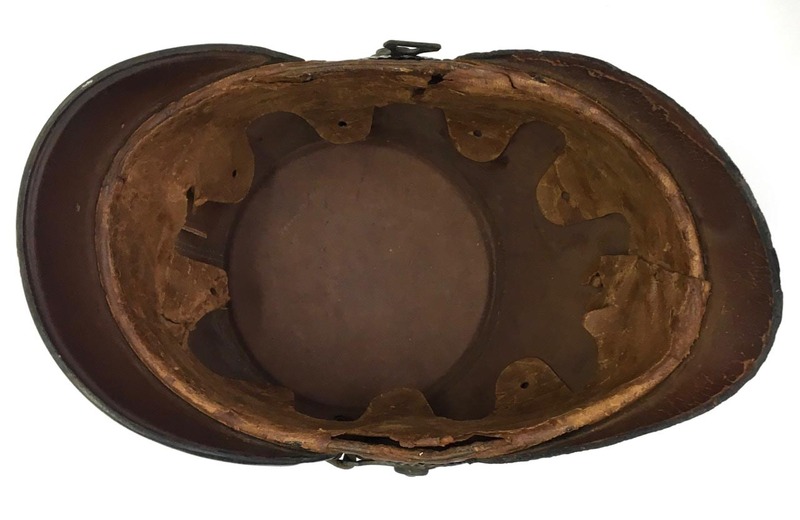 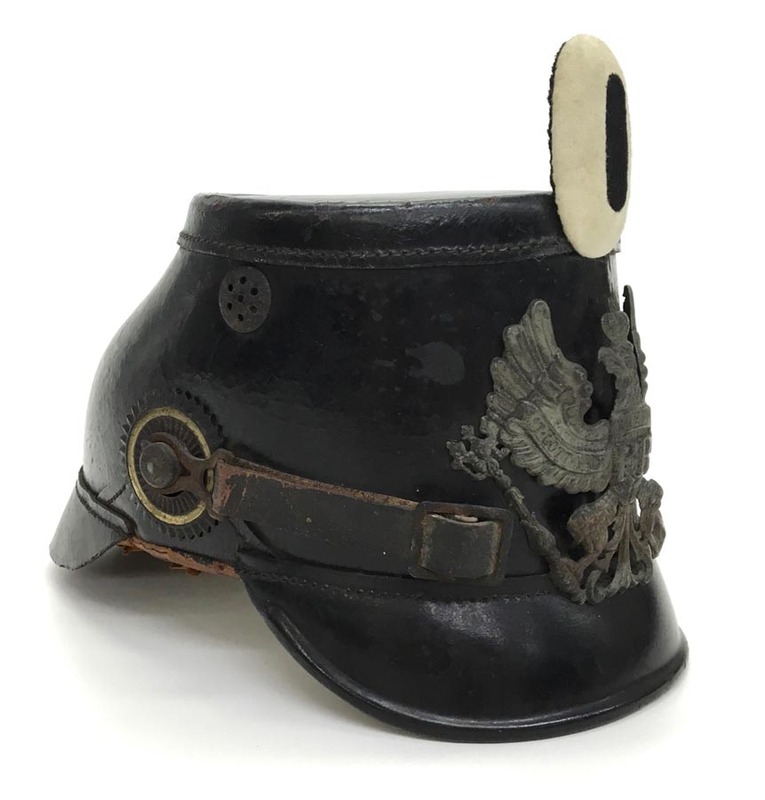 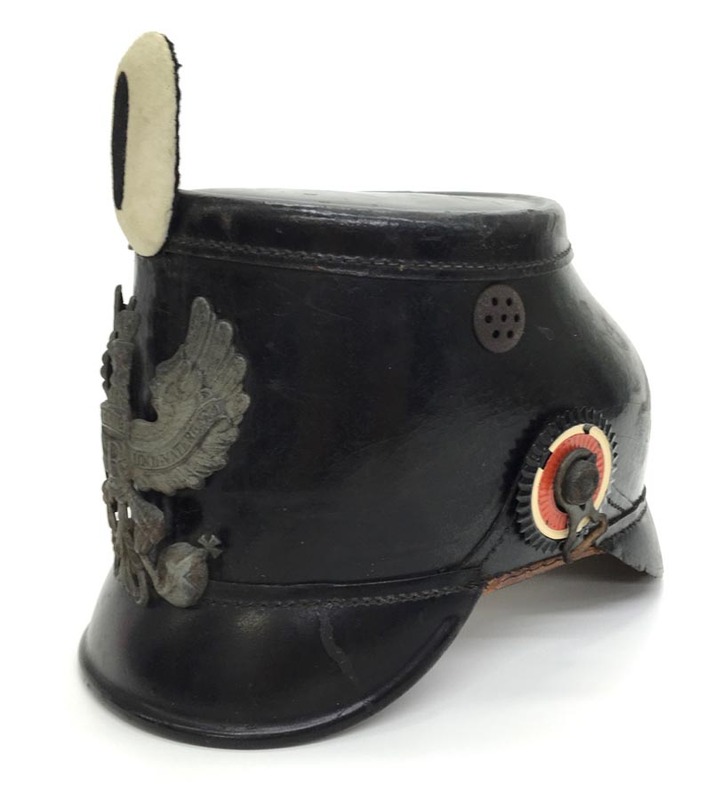 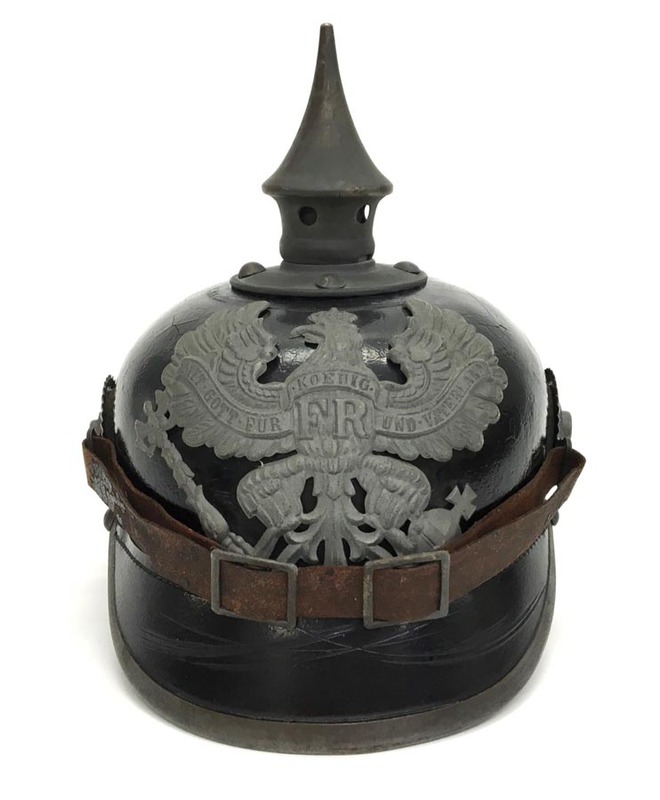 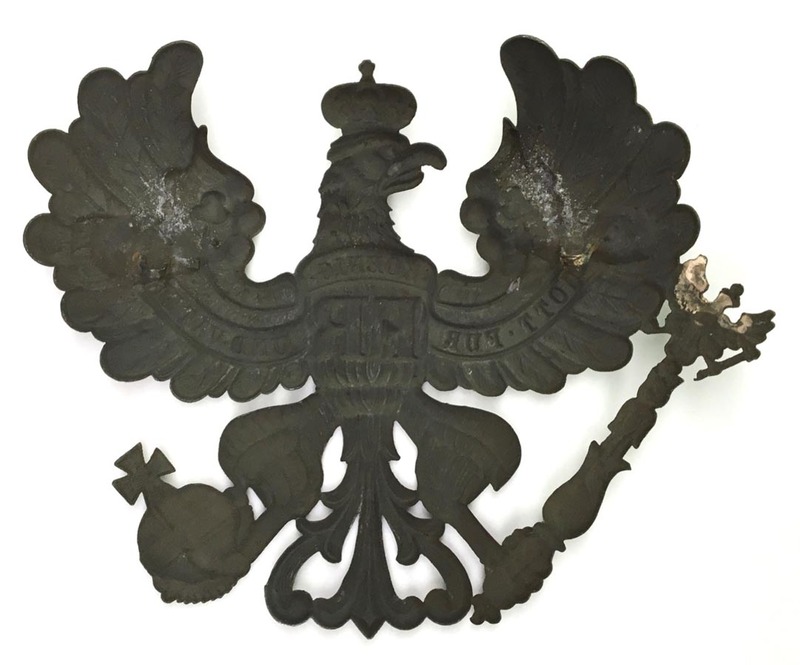 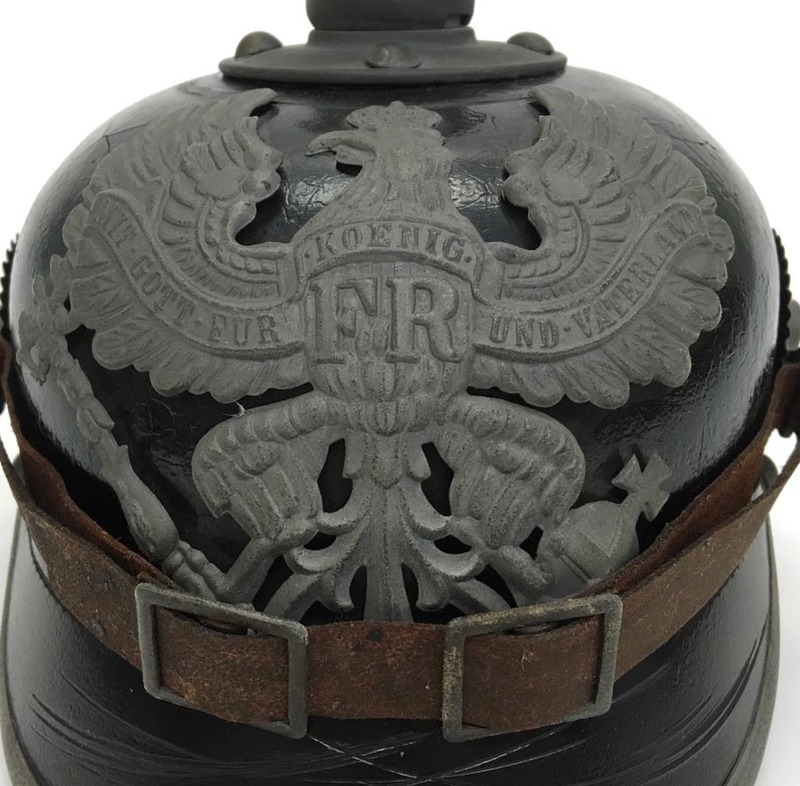 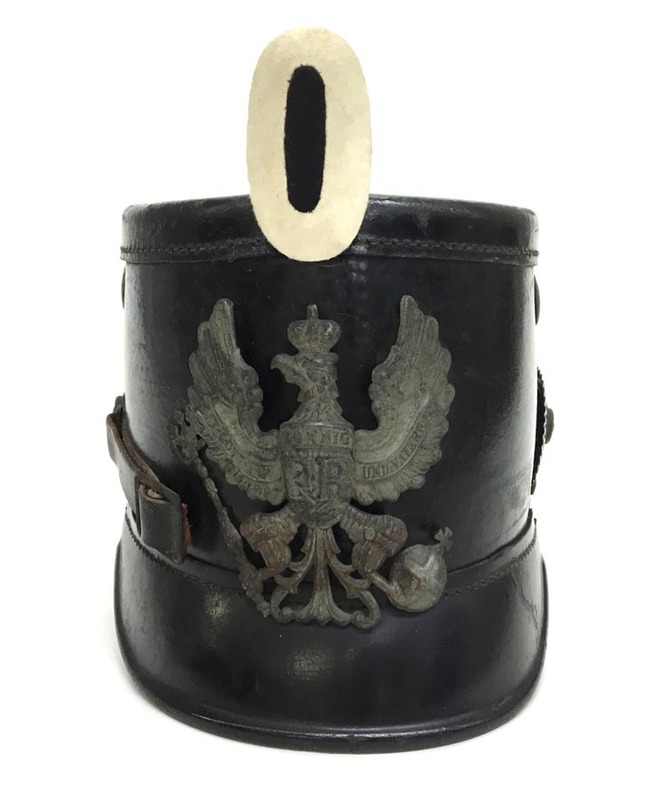 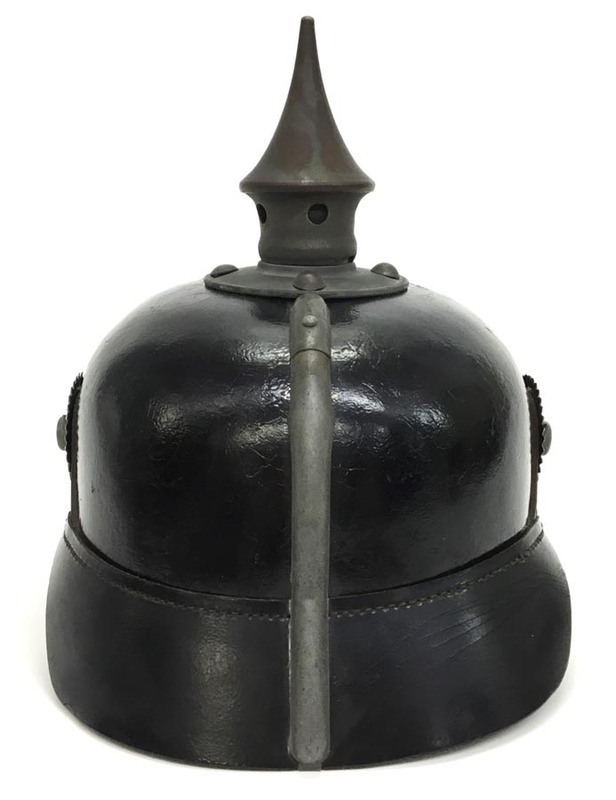 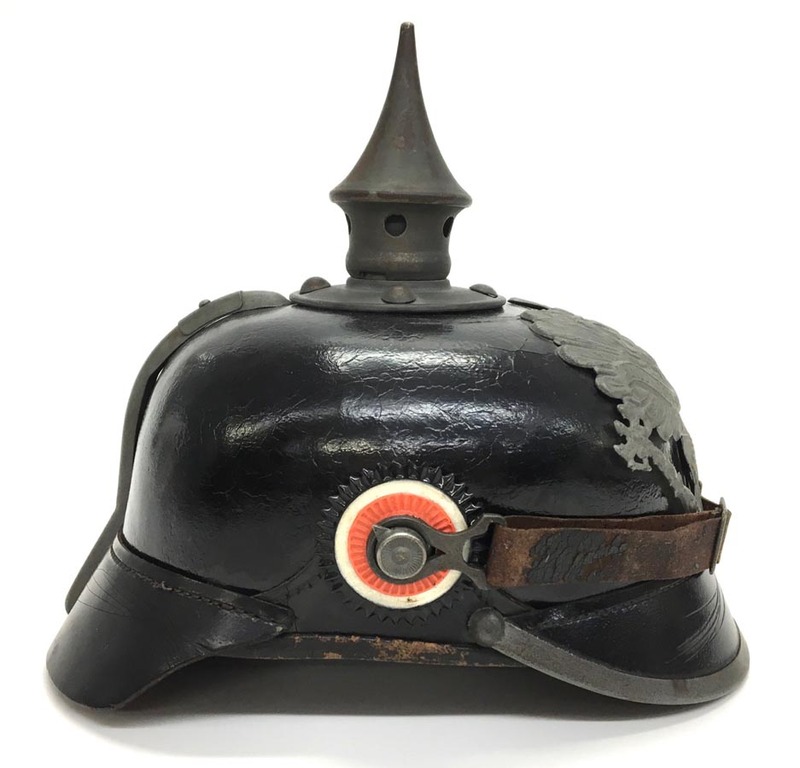 PHYSICAL DESCRIPTION: This Prussian helmet frontplate is in excellent condition. 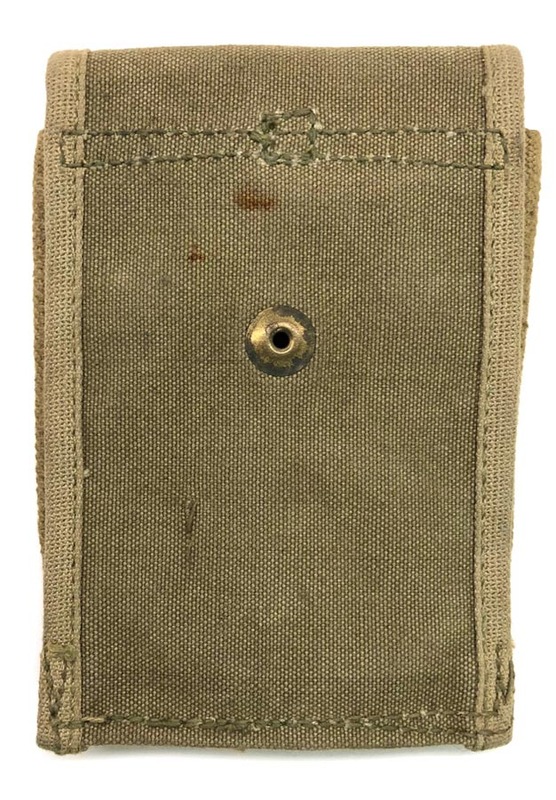 Both attachment prongs are present to backside.